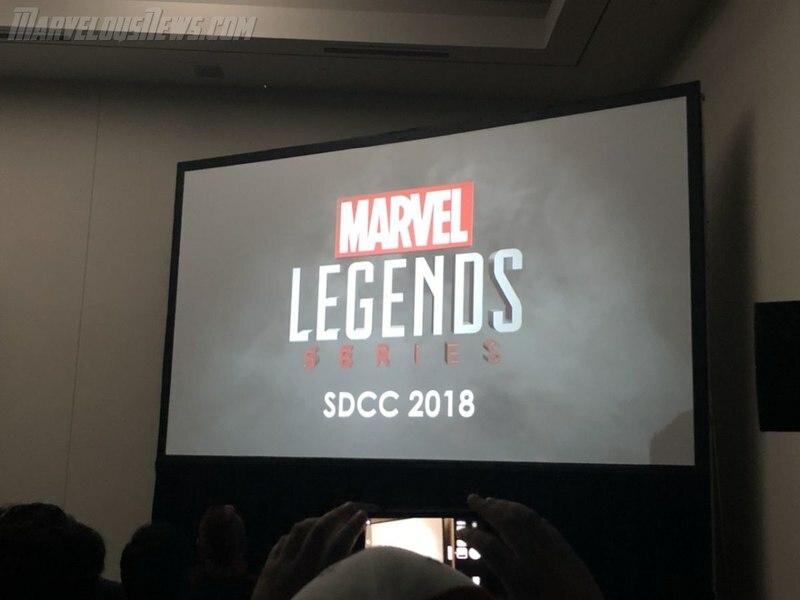 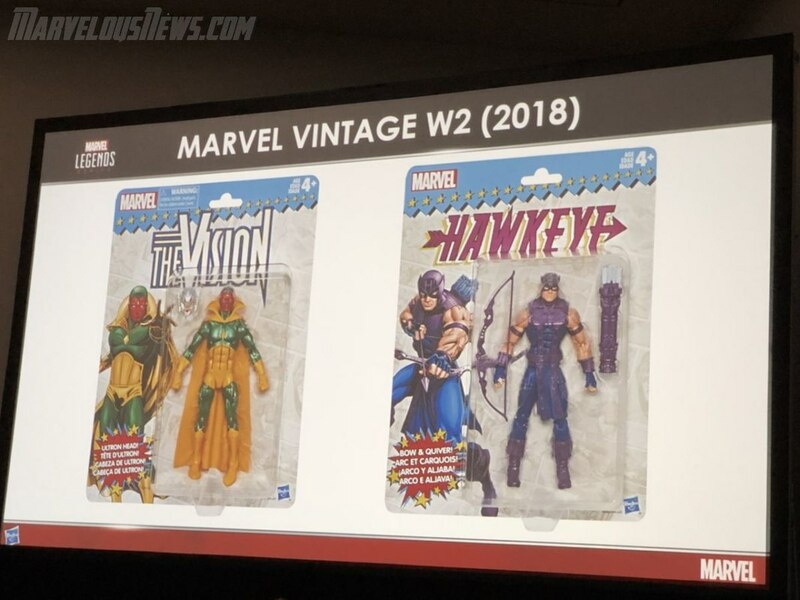 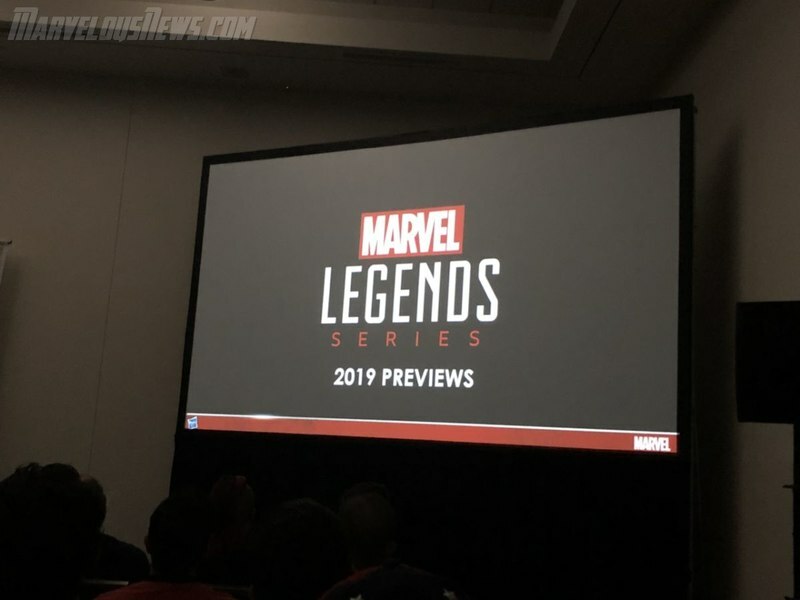 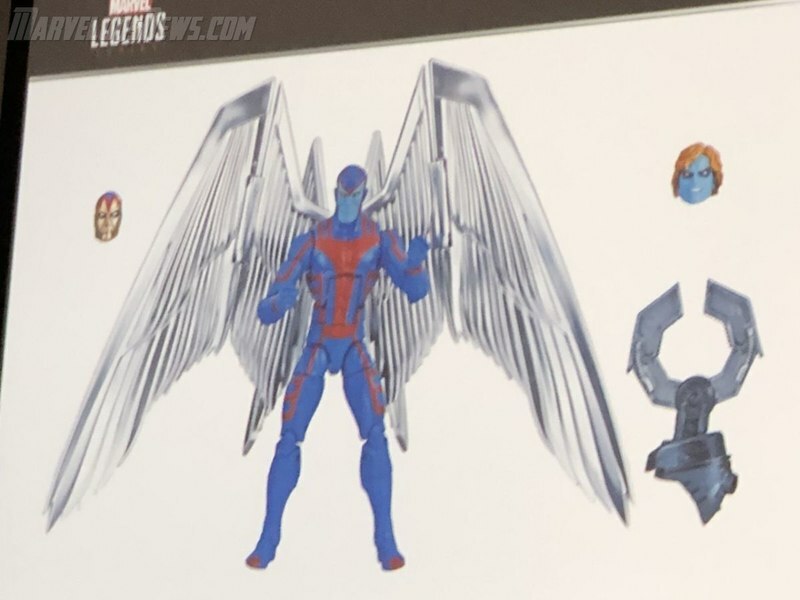 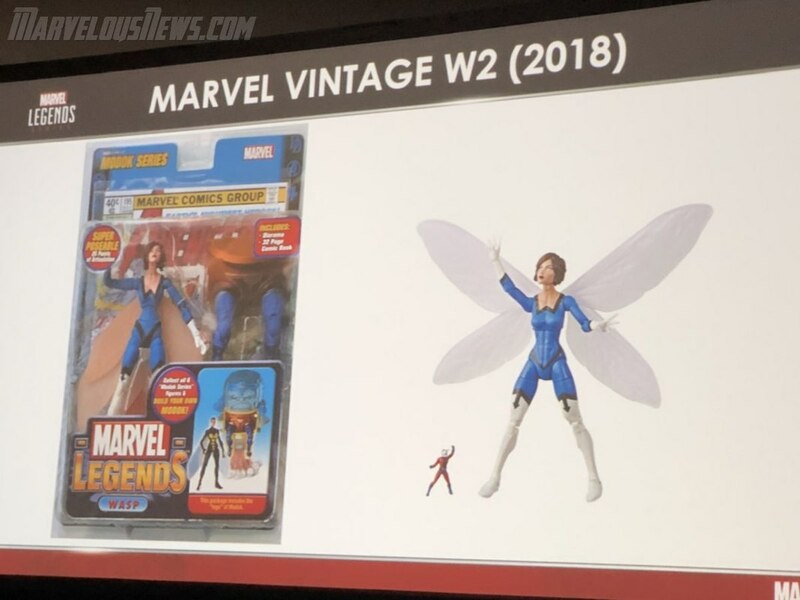 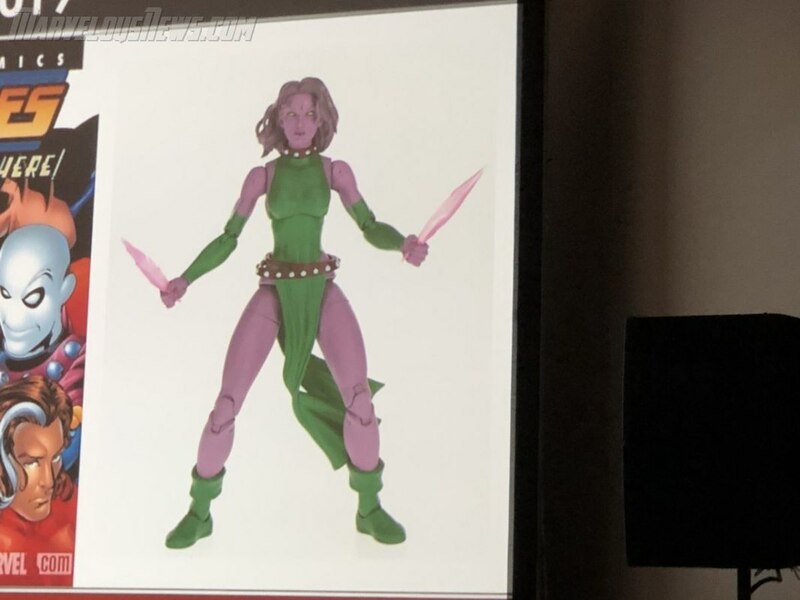 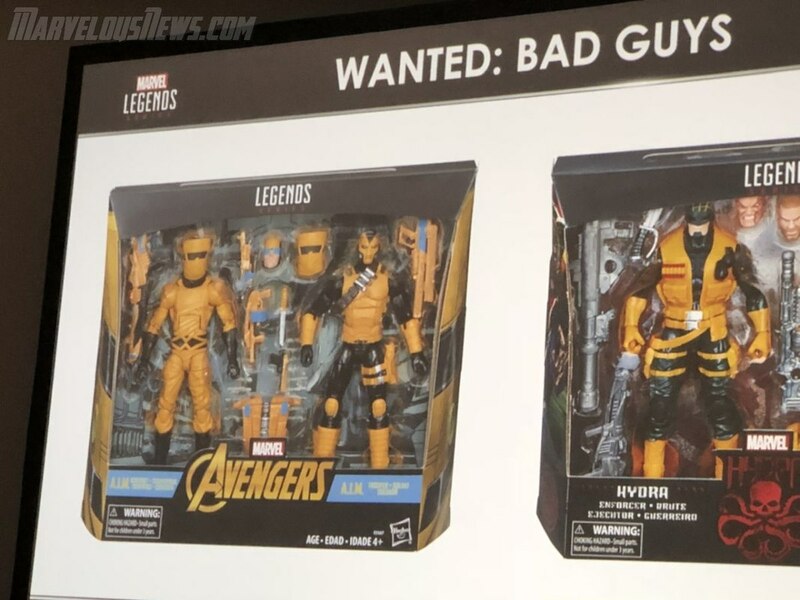 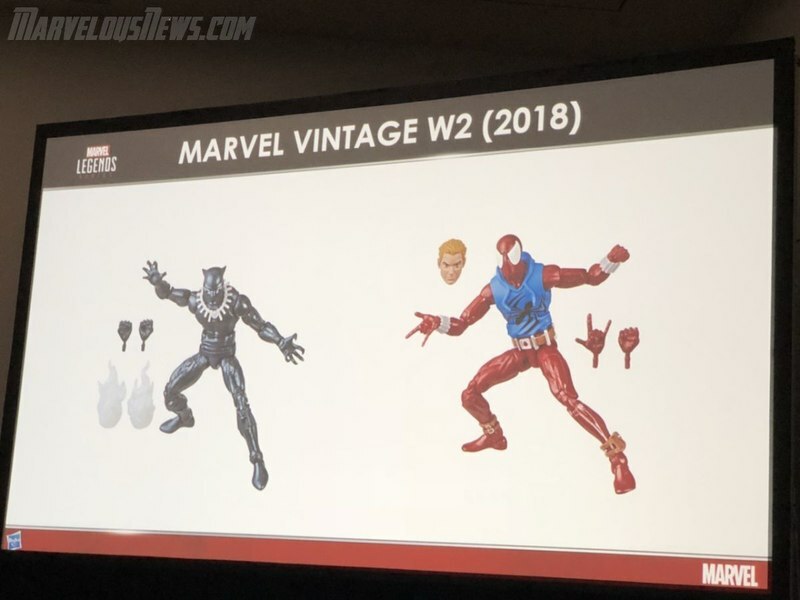 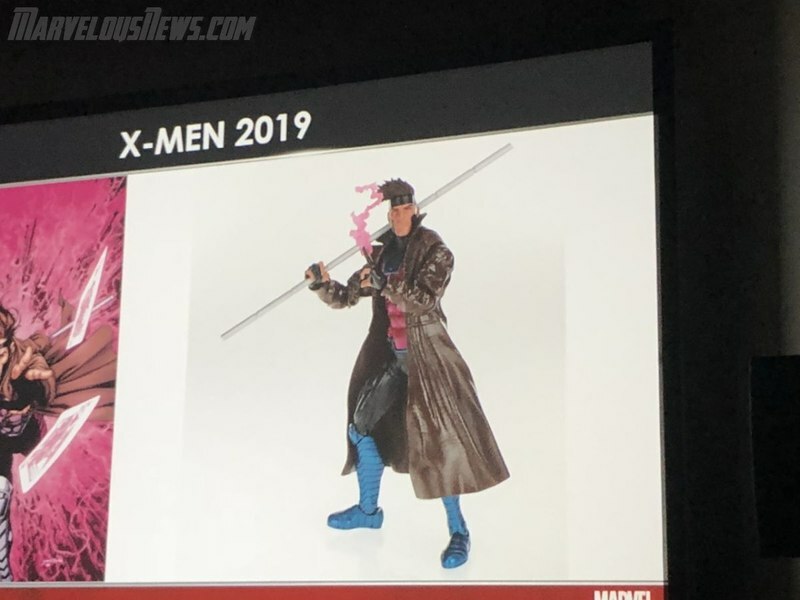 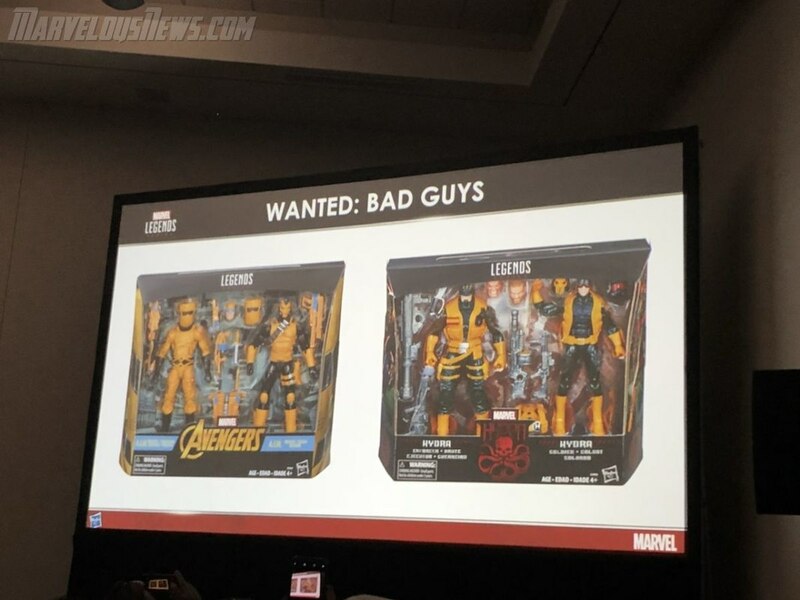 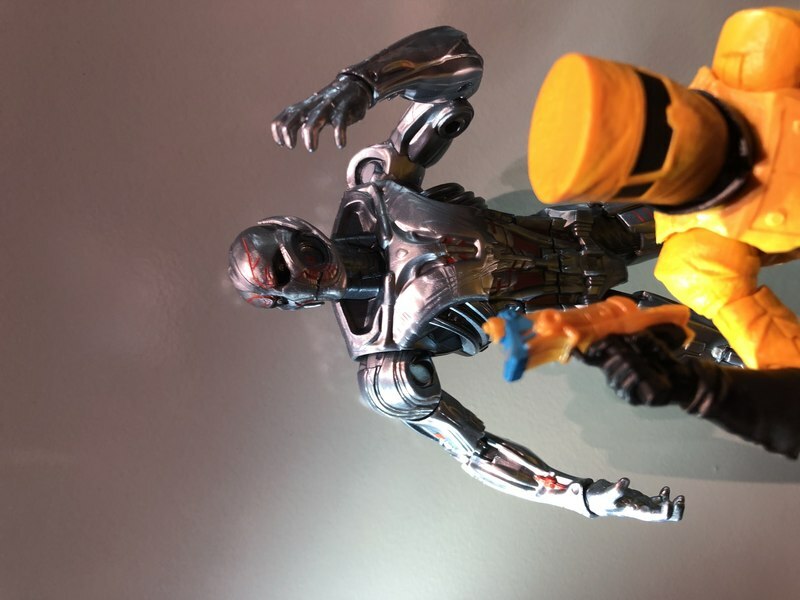 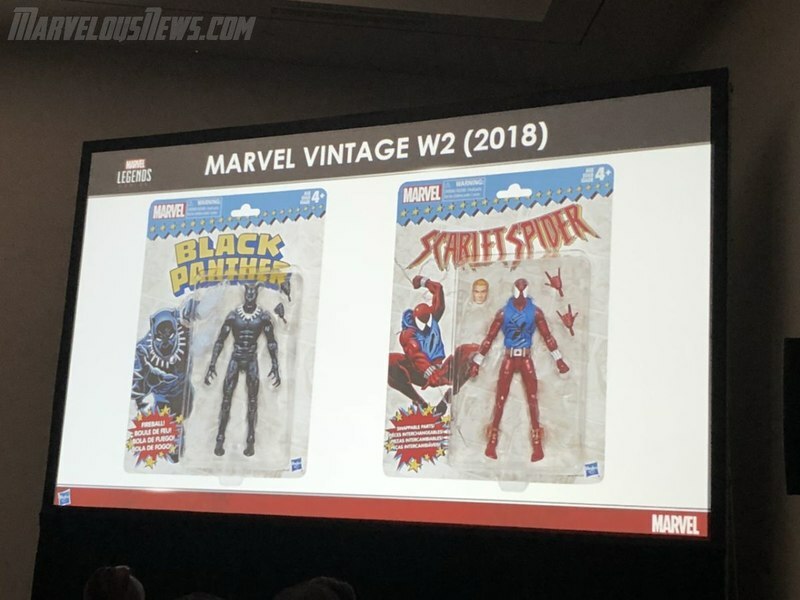 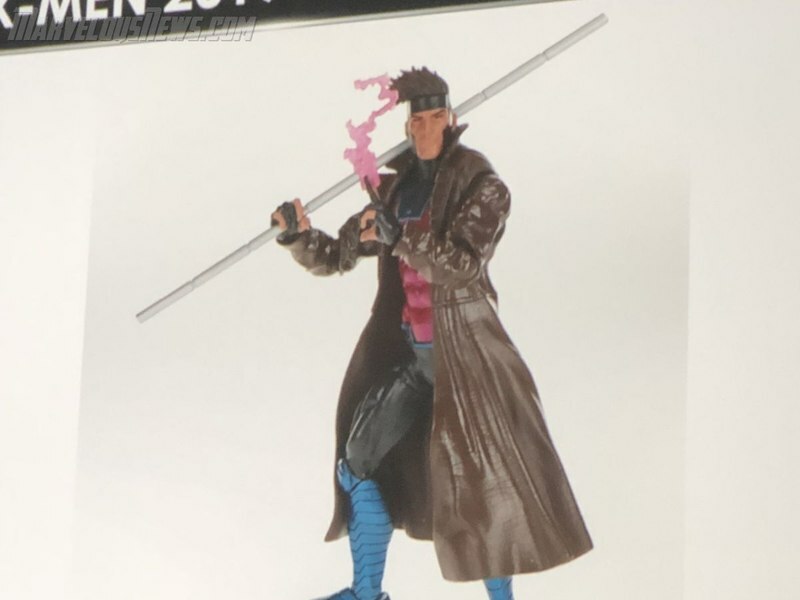 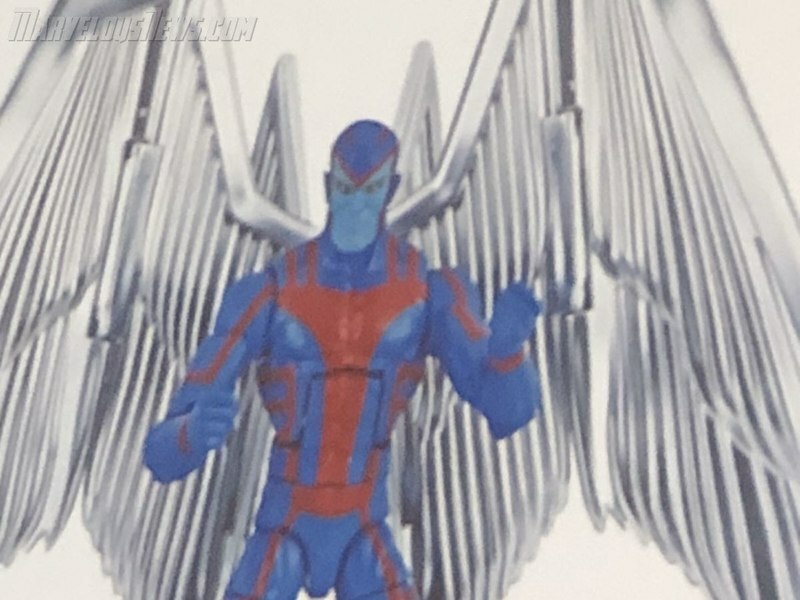 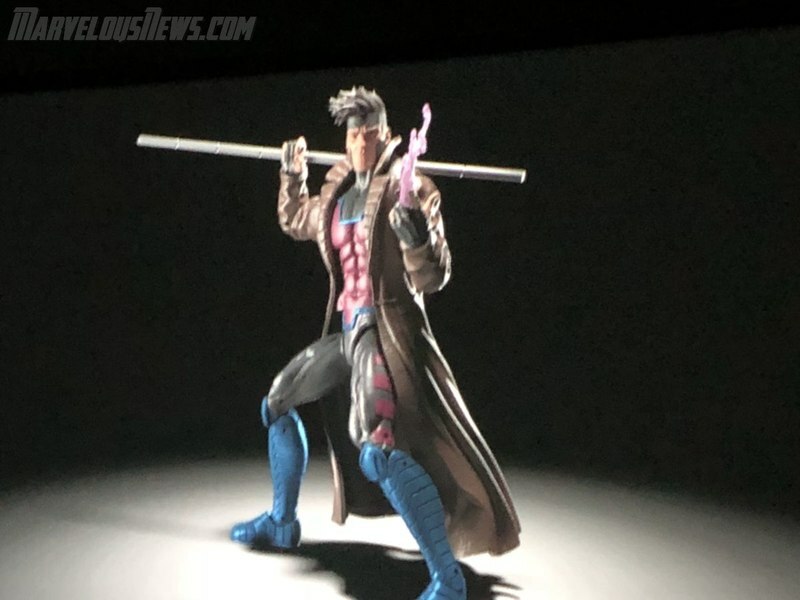 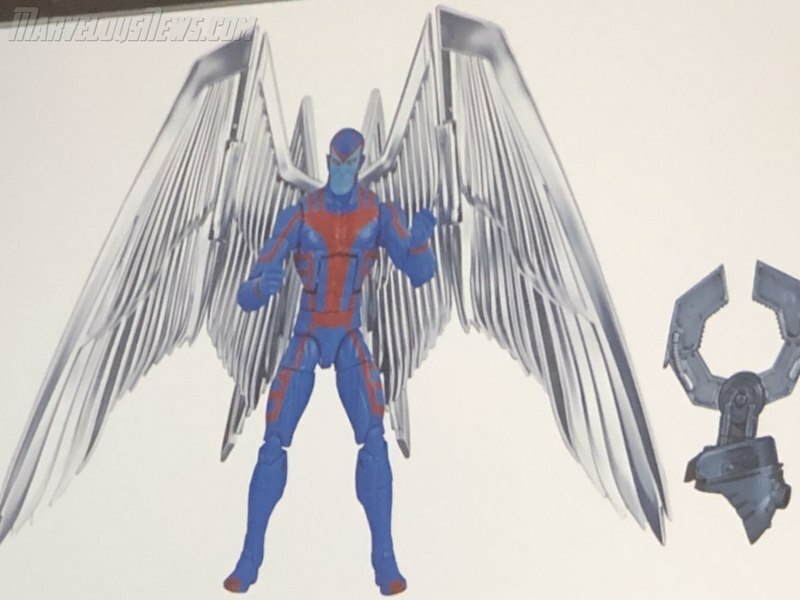 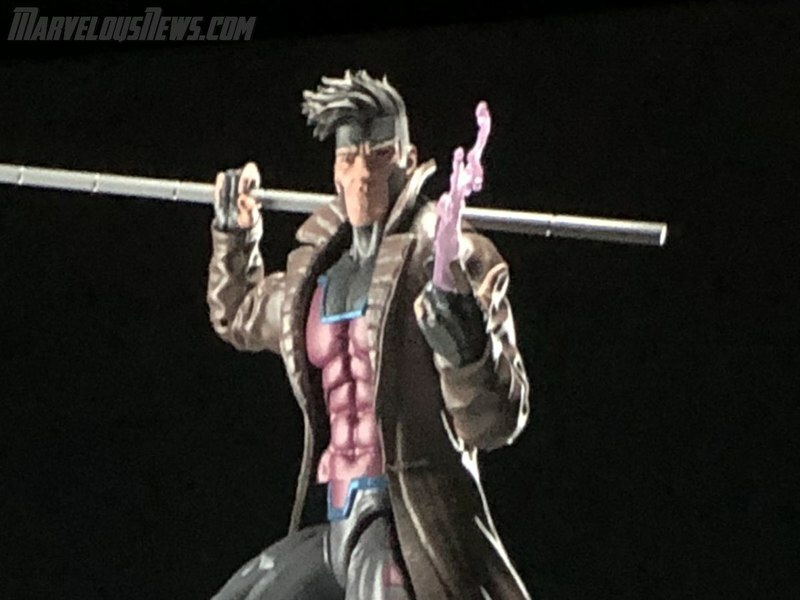 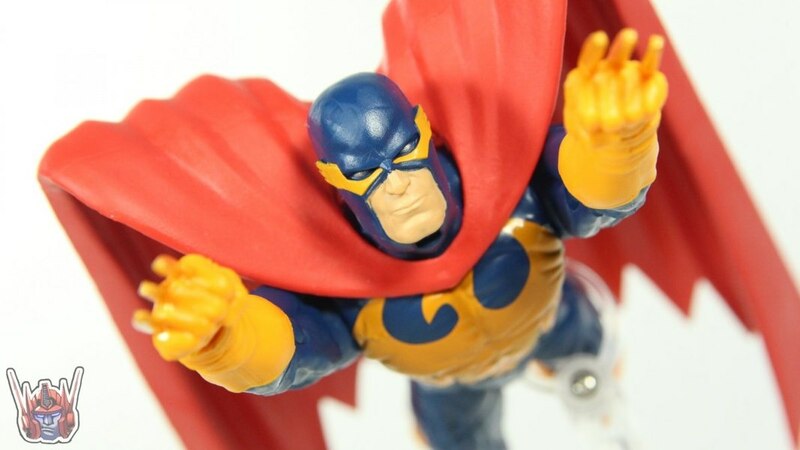 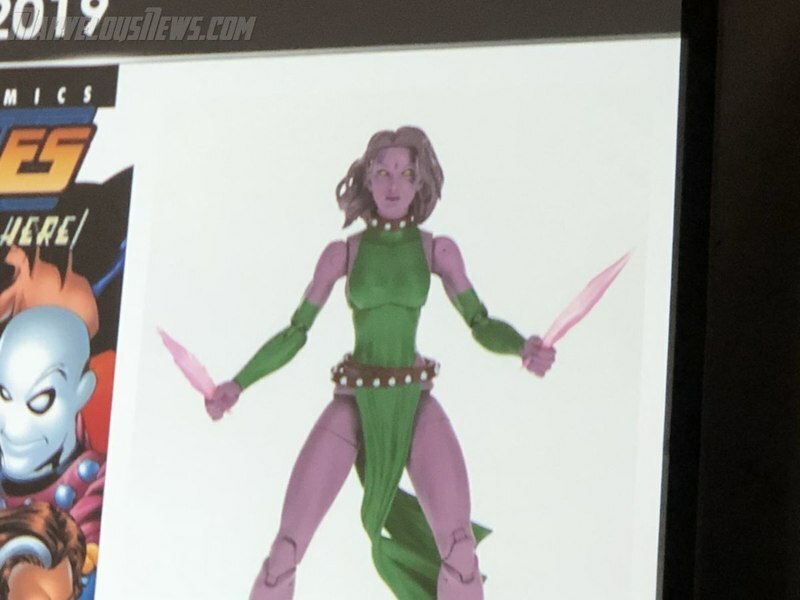 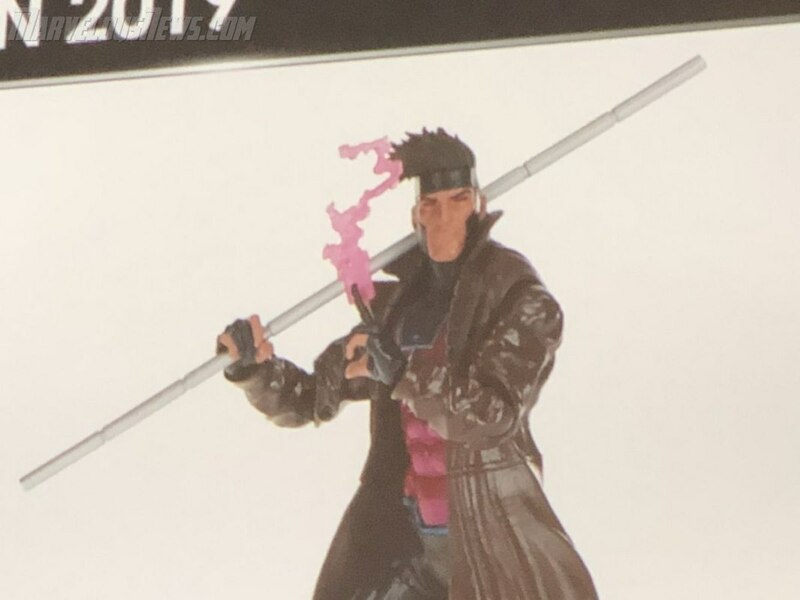 We are blogging live from the Hasbro Marvel Legends panel at the 2018 San Diego Comic Con. 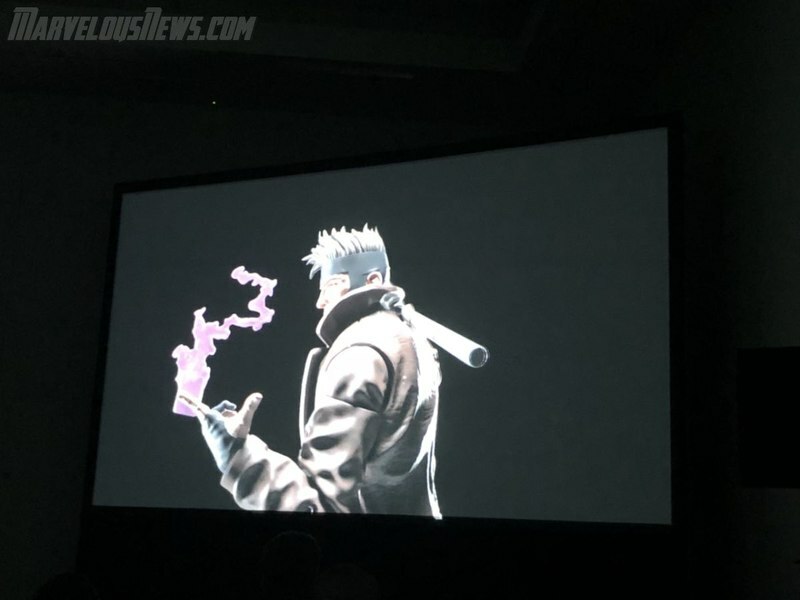 We will be making updates with images and info often here over the course of the next hour, so keep refreshing your browser during that time to see the latest updates. 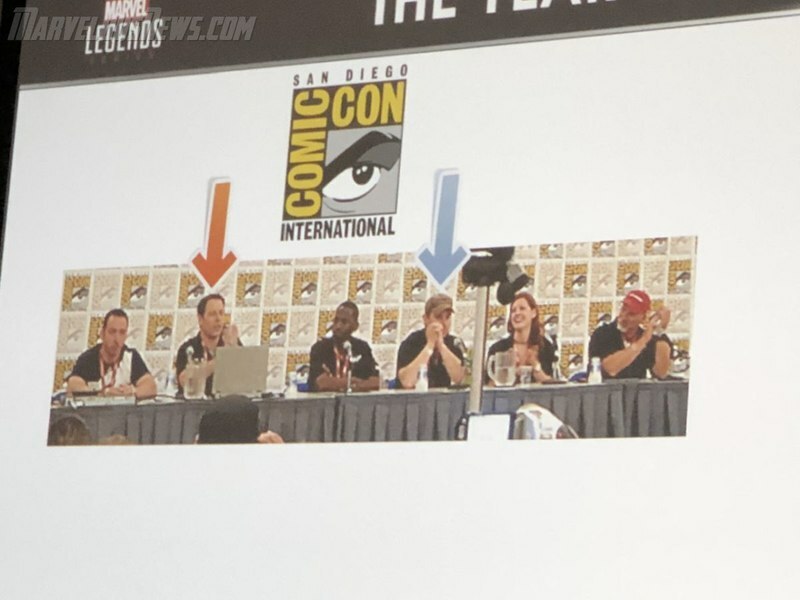 Ryan Ting and Dwight Stall are on the panel. 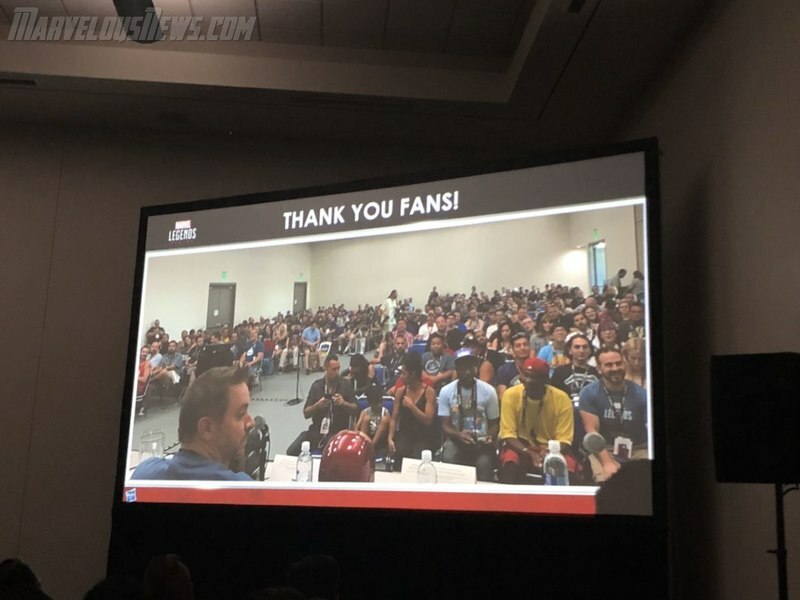 They want to thank you guys. 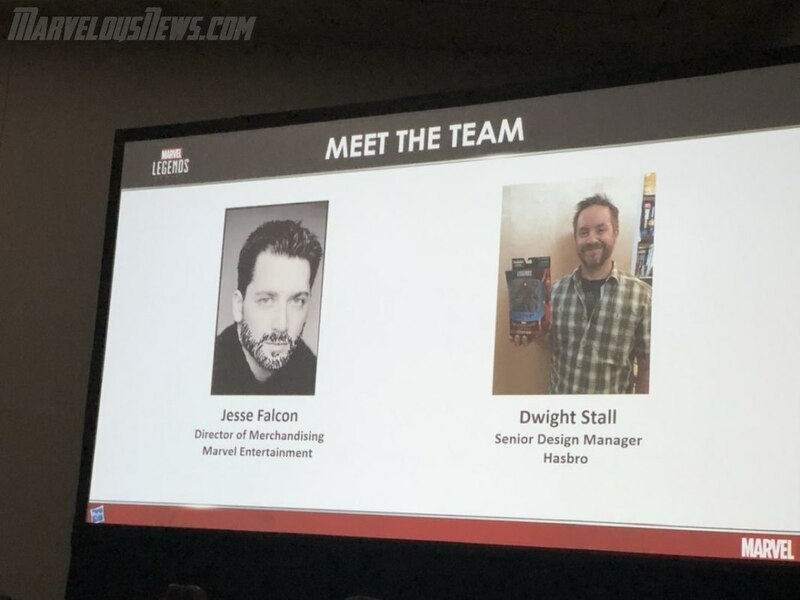 Jesse Falcon is on the panel. 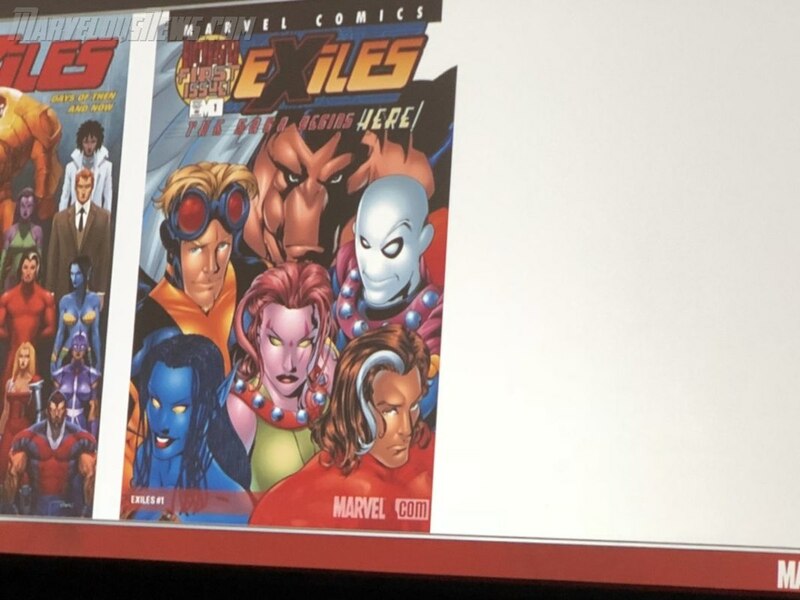 Mike Pullano, Becky Nuger, Jeff Labovitz, Tony Colella. 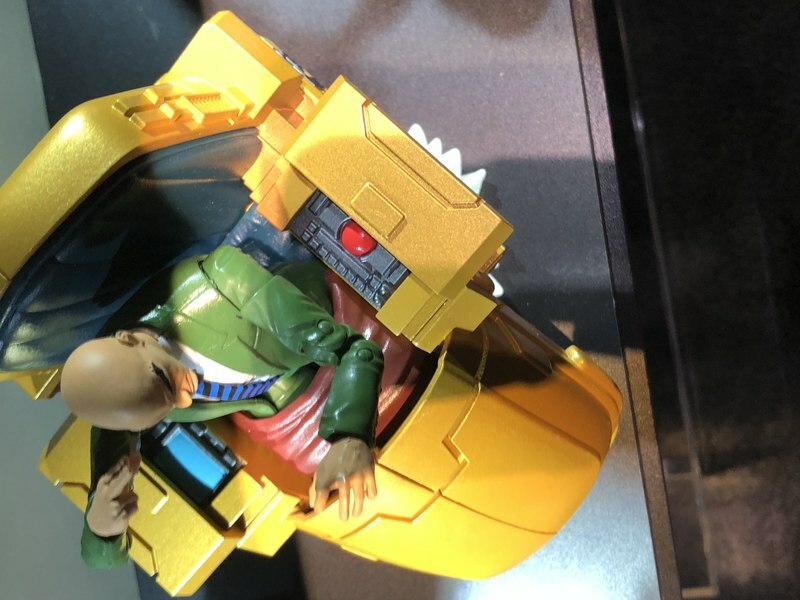 Going over the kids lines. 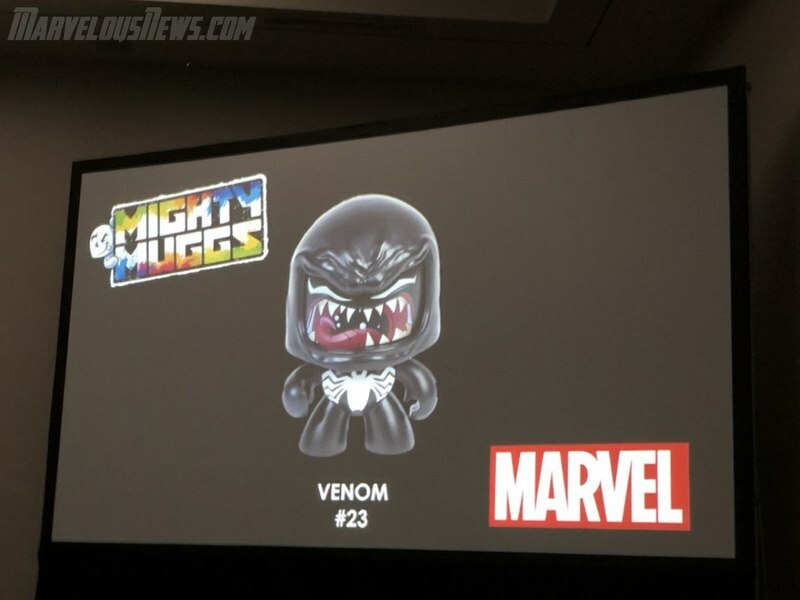 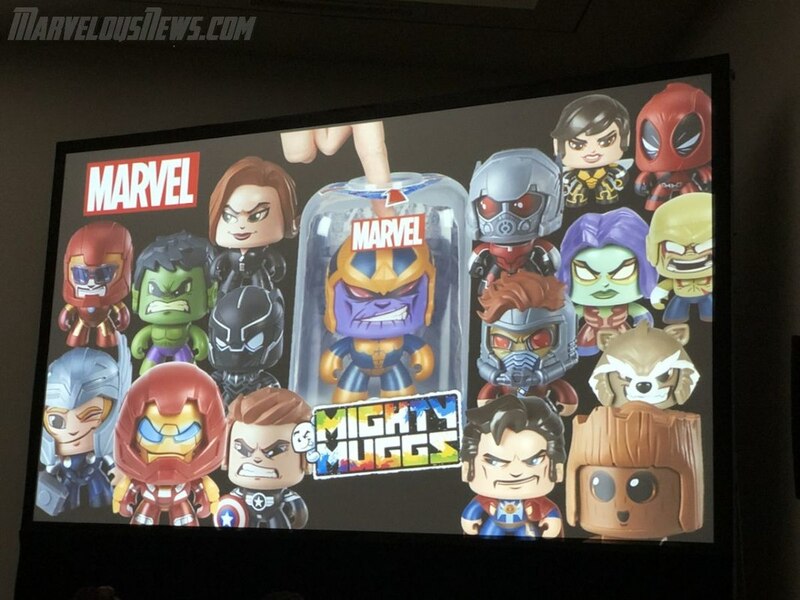 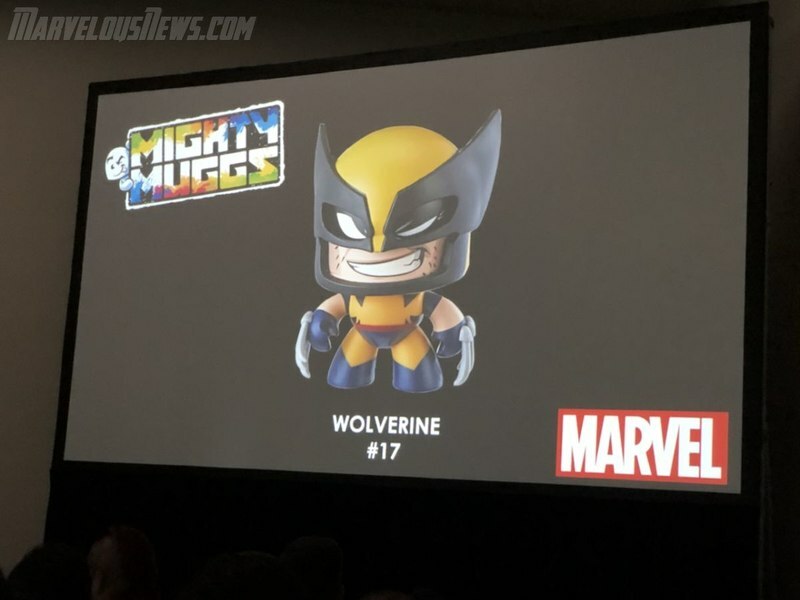 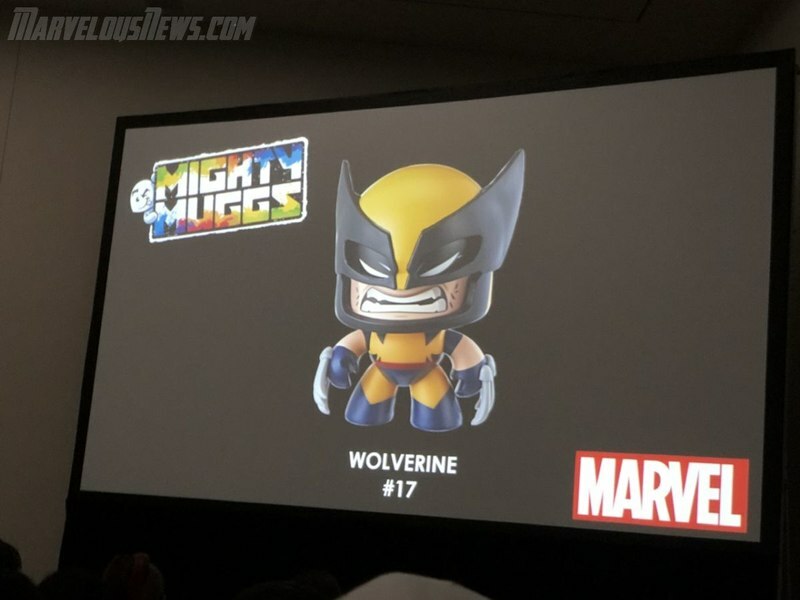 Now talking Mighty Muggs. 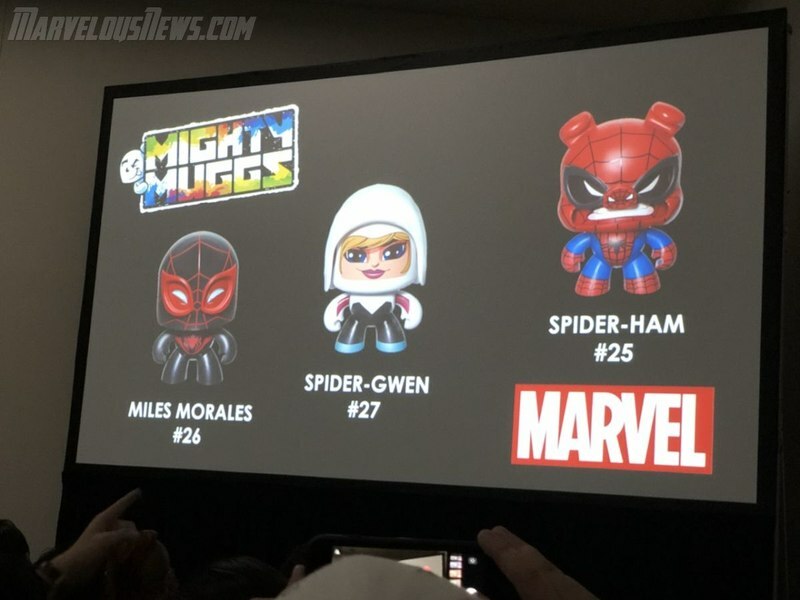 Venom, Wolverine, Miles Morales, Spider-Gwen and Spider-Ham. 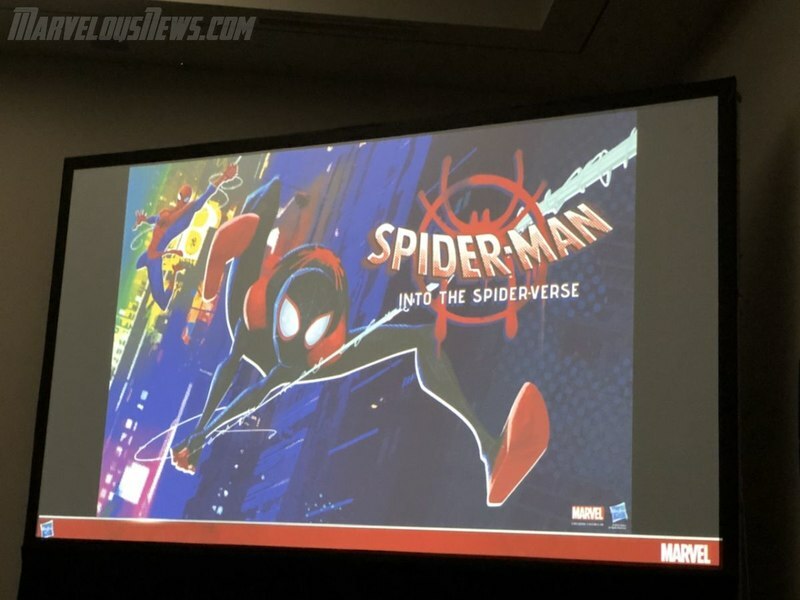 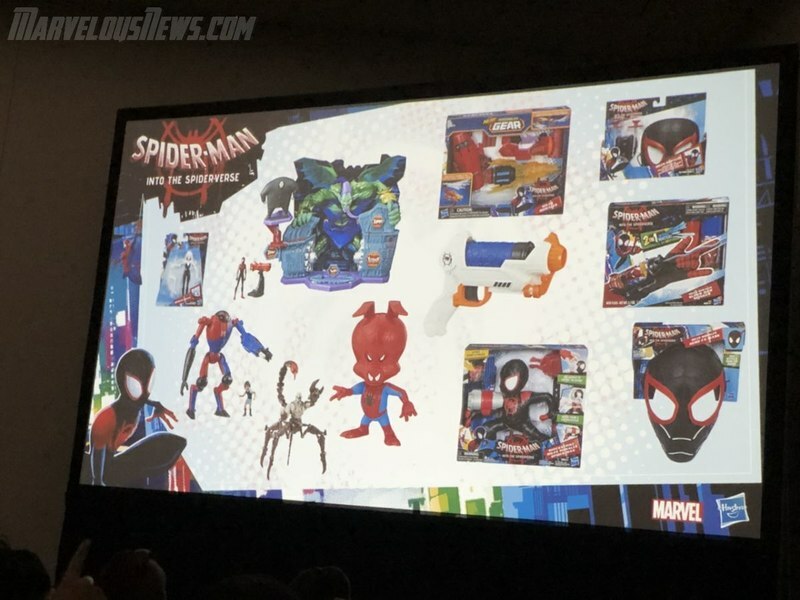 Into The Spider-Verse kids line. 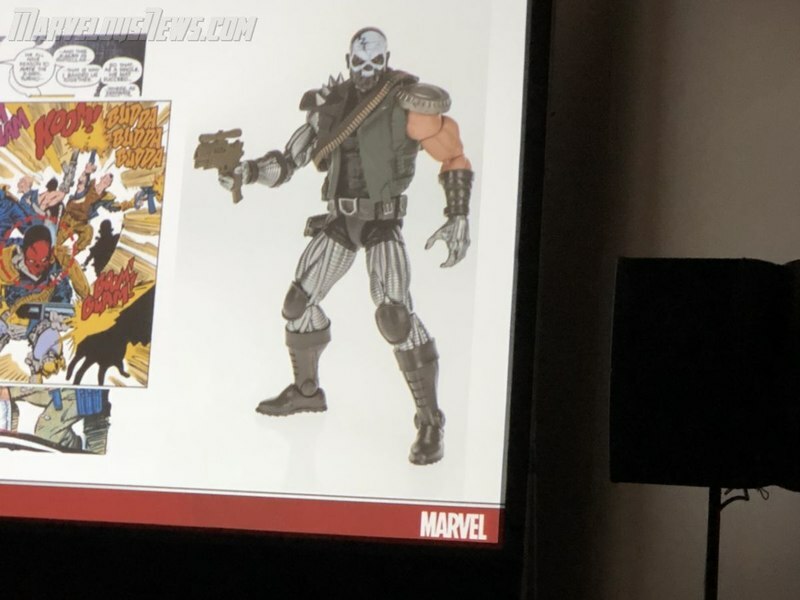 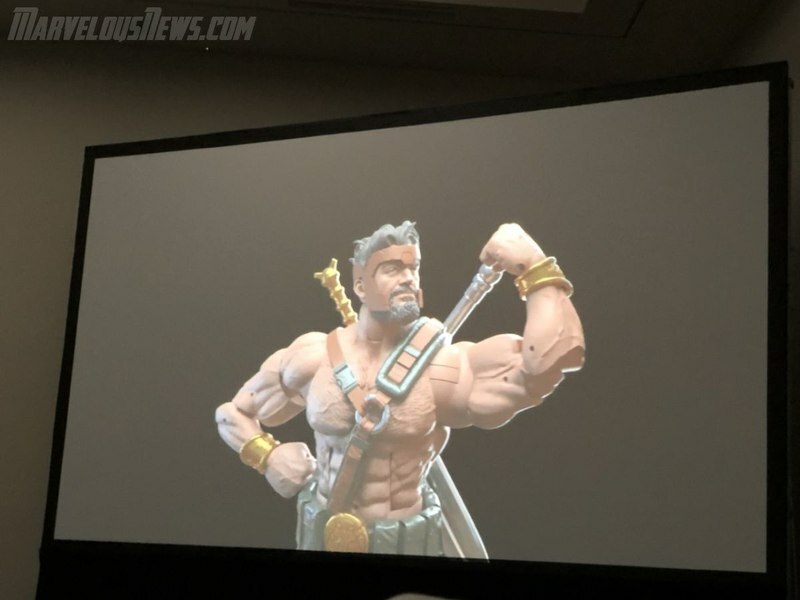 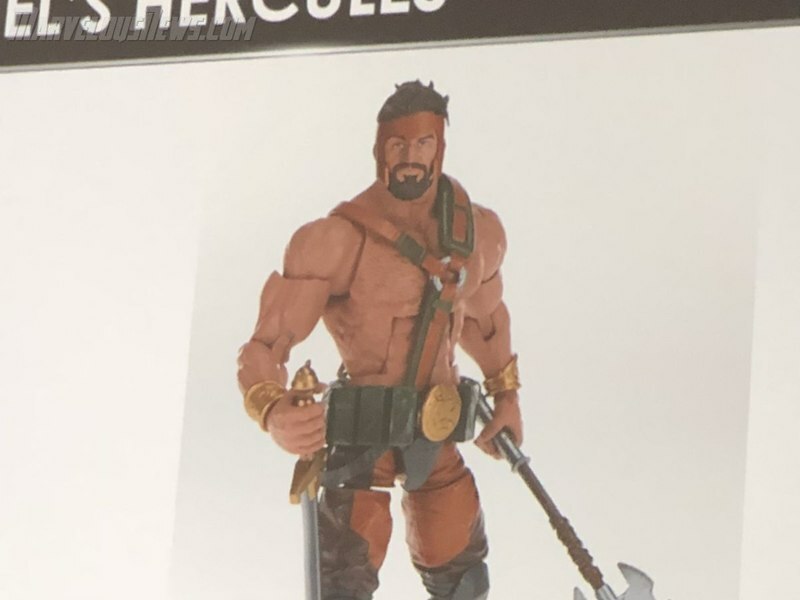 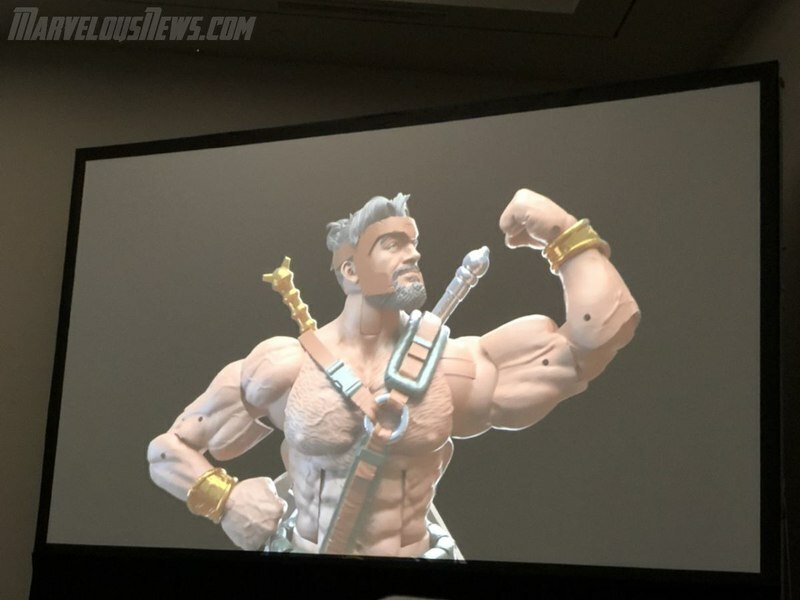 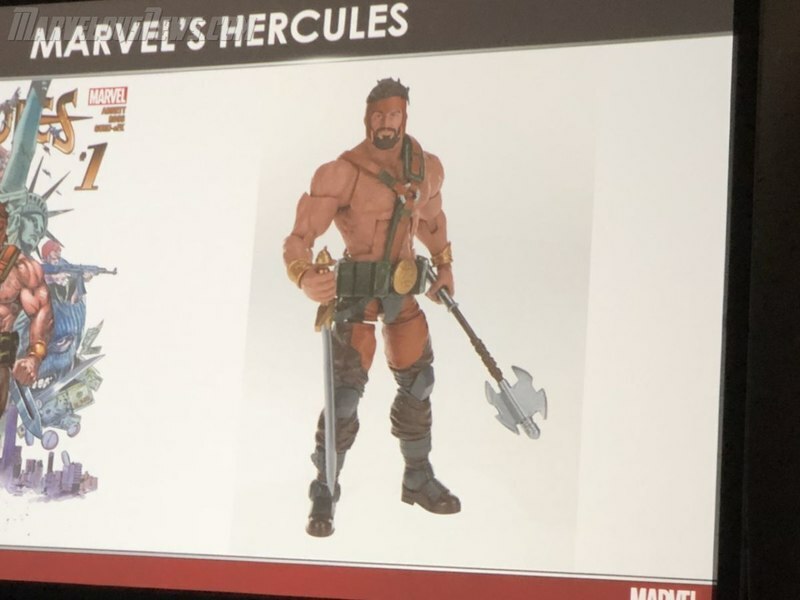 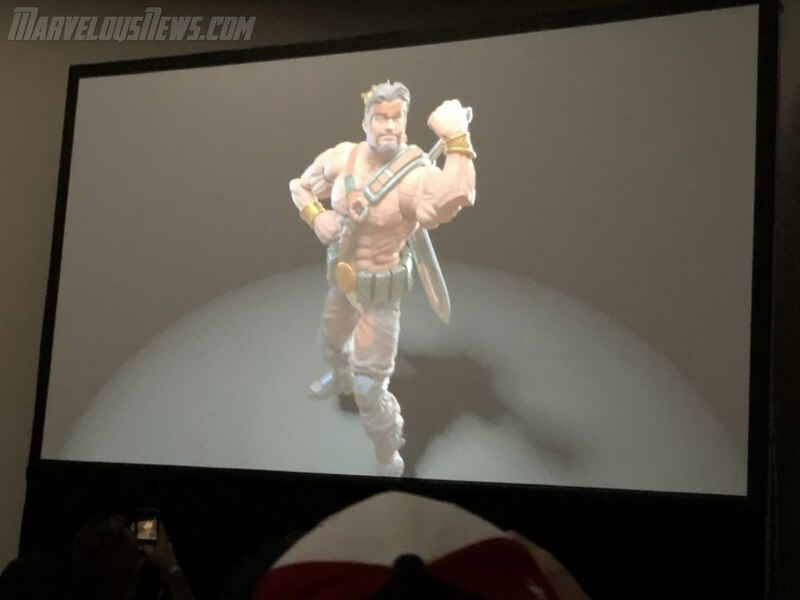 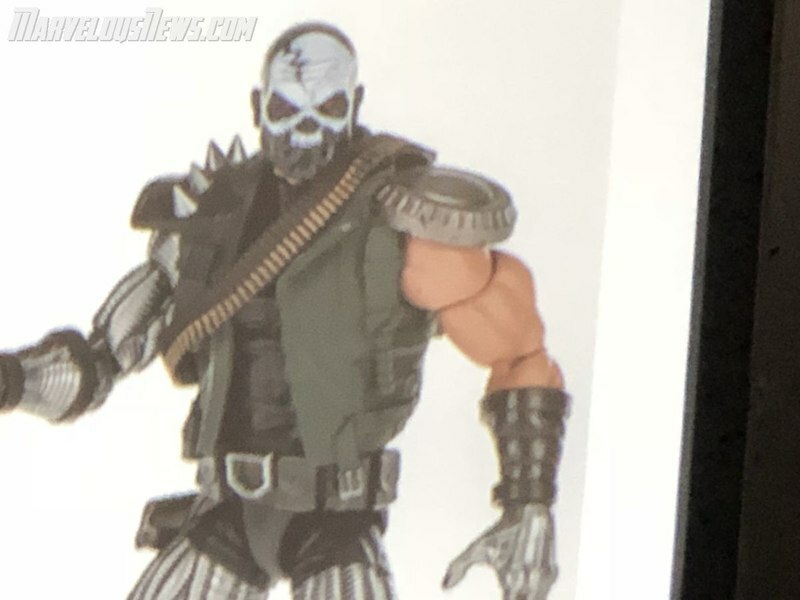 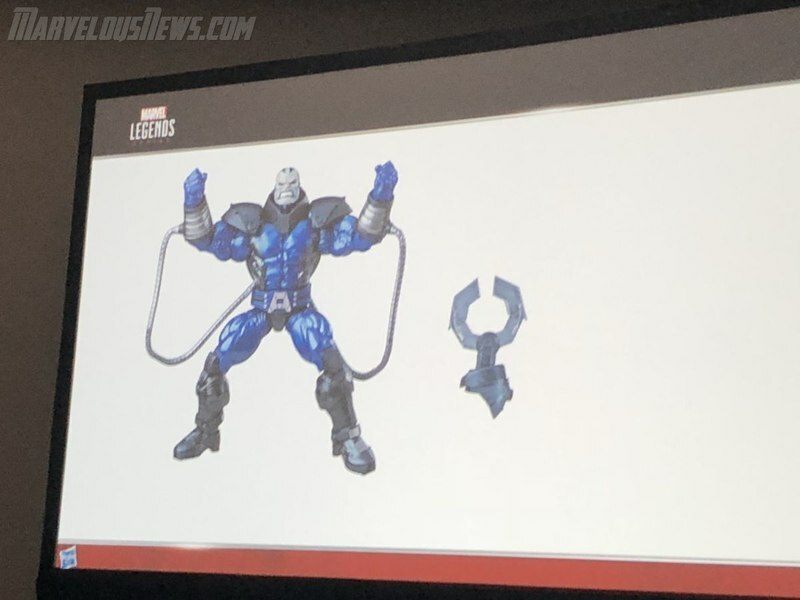 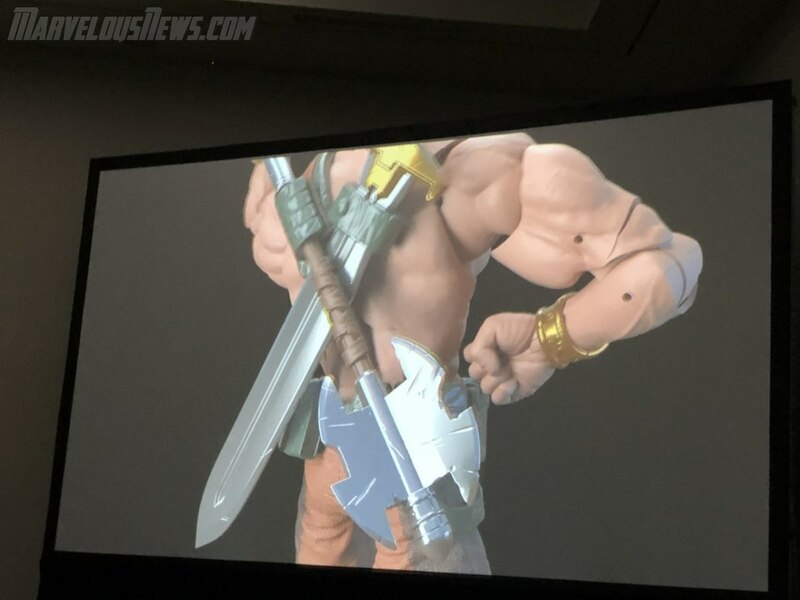 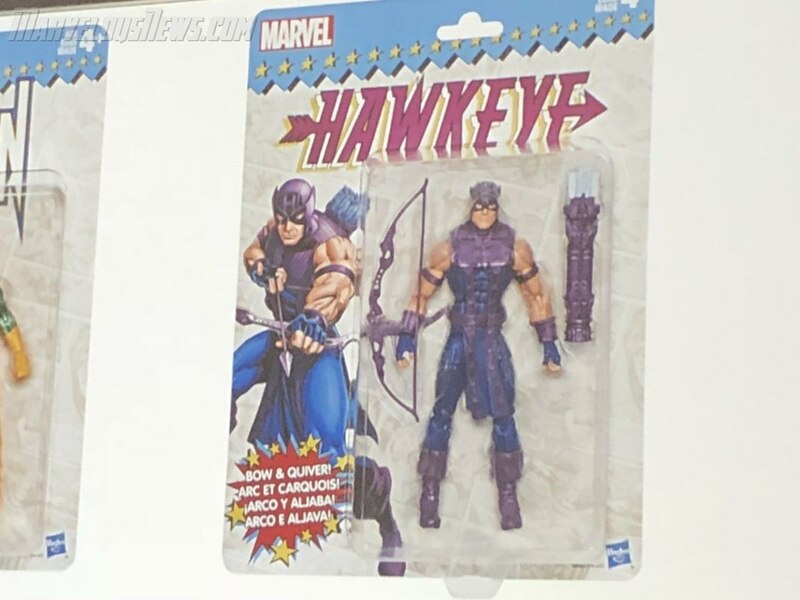 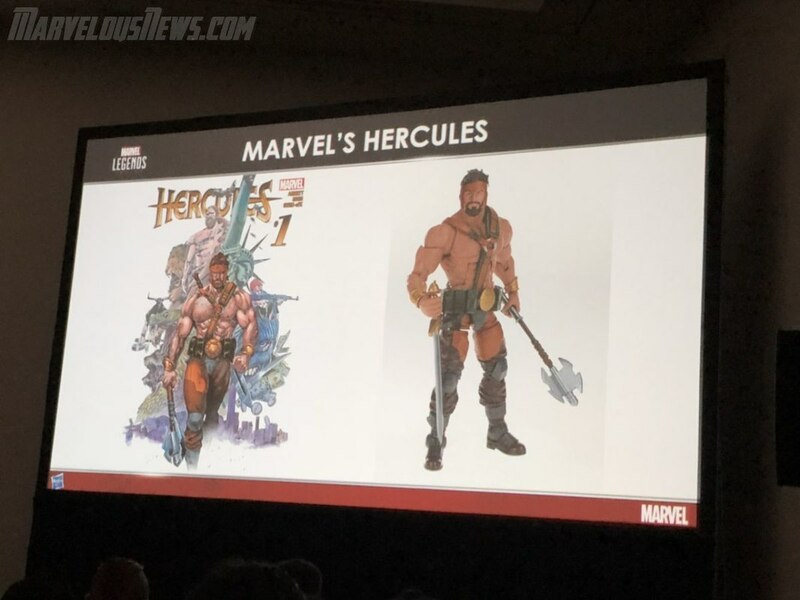 Marvel Legends Hercules is announced. 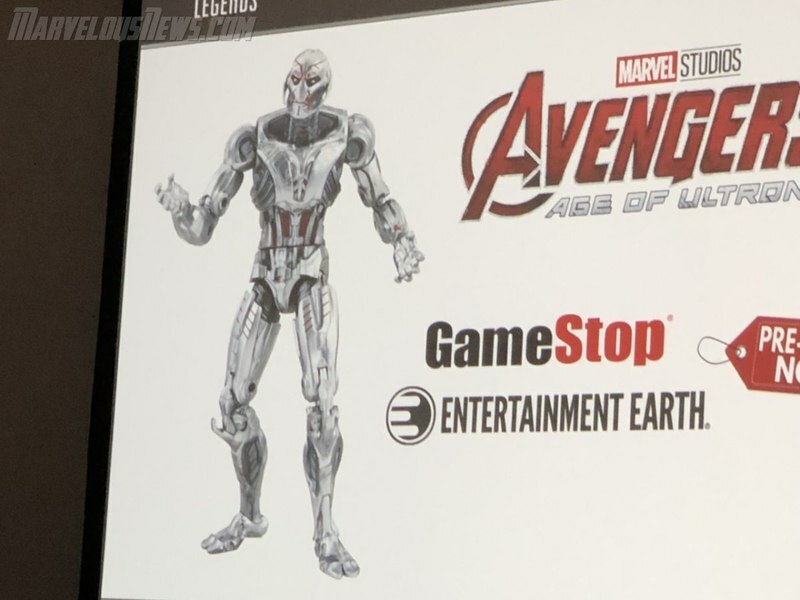 Be part of the Avengers line 2019. 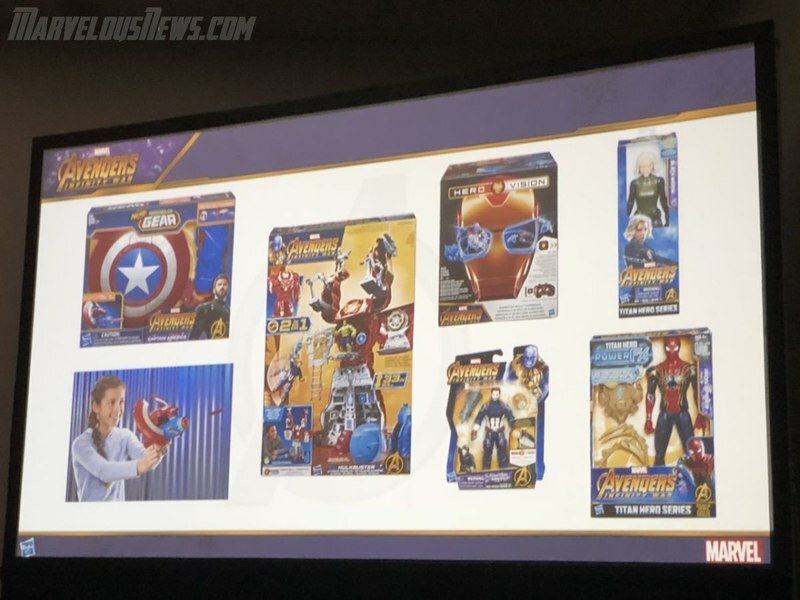 Marvel Legends MCU line and Prop line. 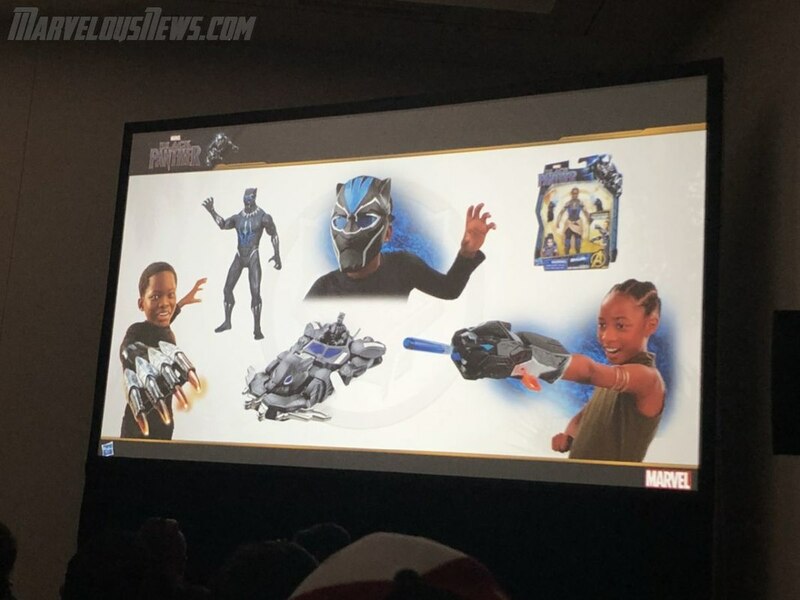 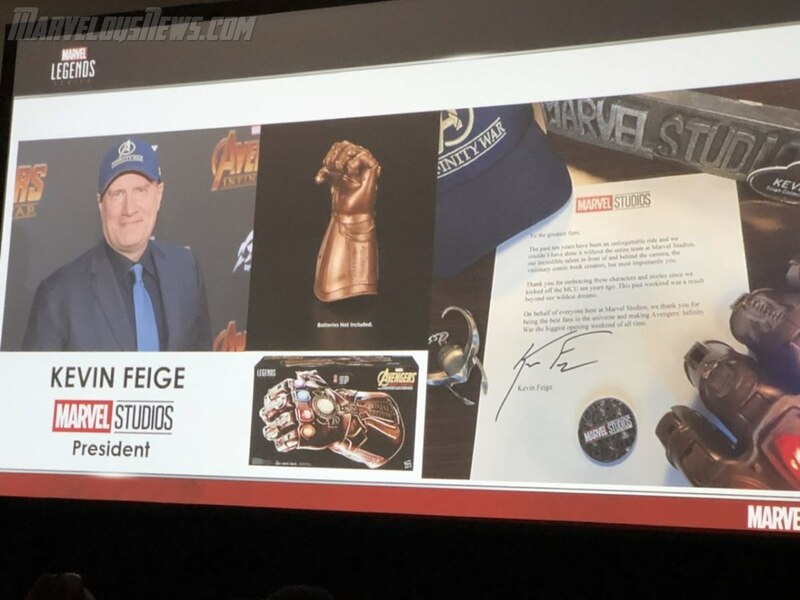 Going over already released items including Black Panther helmet and Infinity Gauntlet. 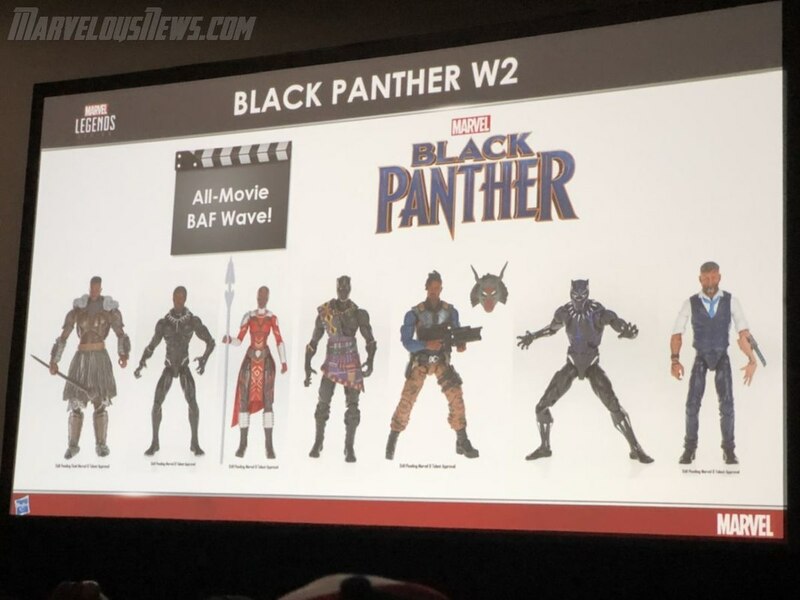 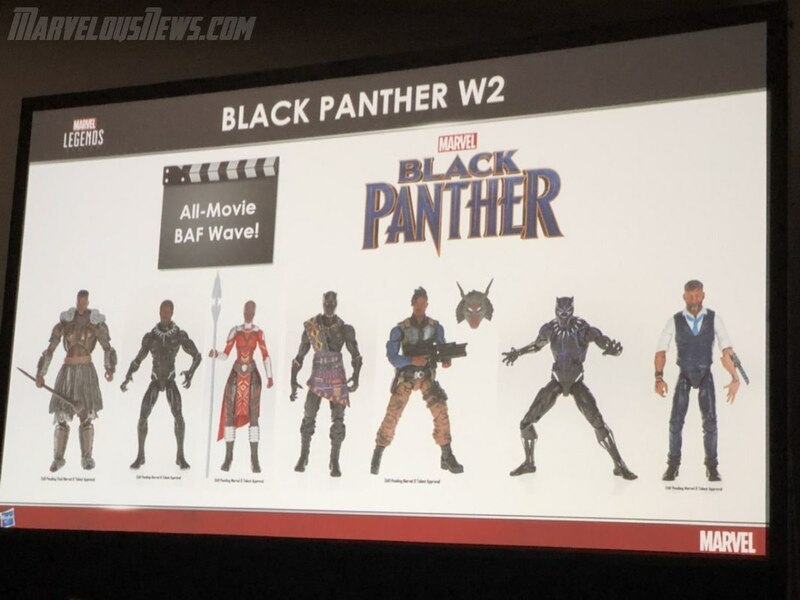 Black Panther Marvel Legends Wave 2, all movie figures. 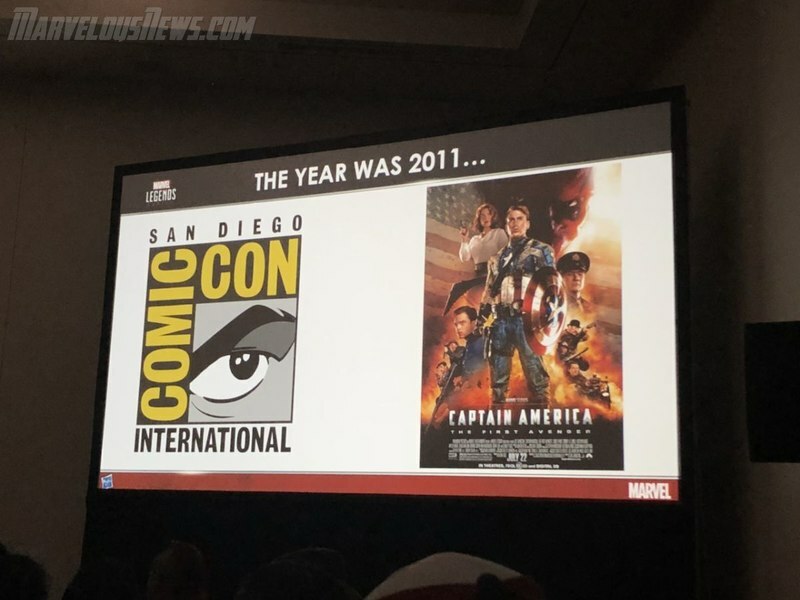 Be out at the end of the year. 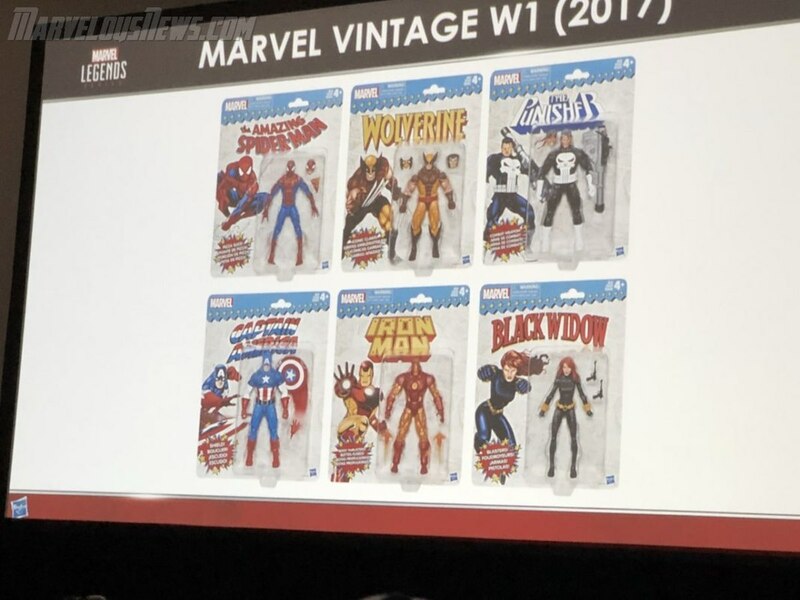 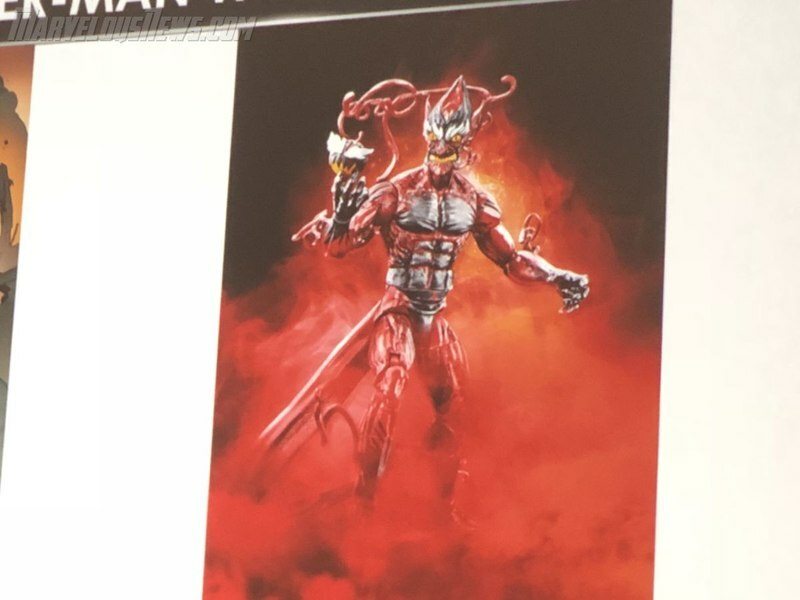 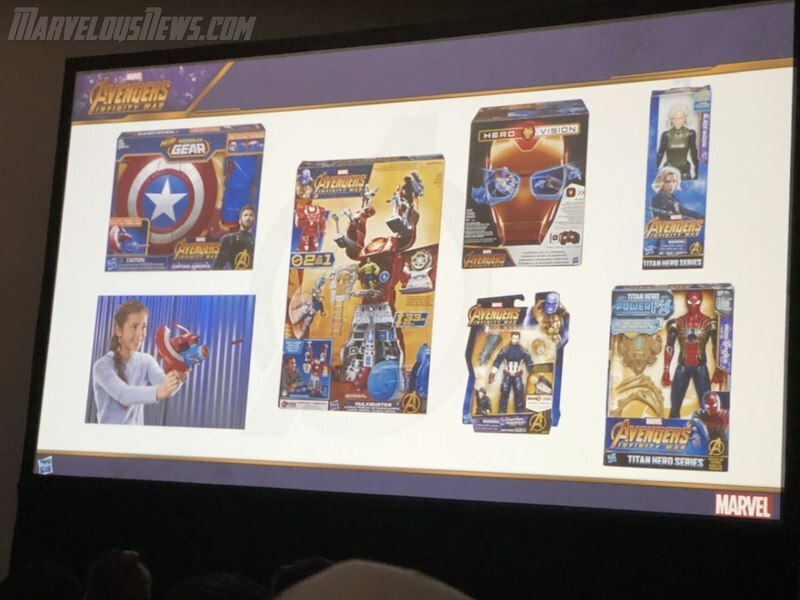 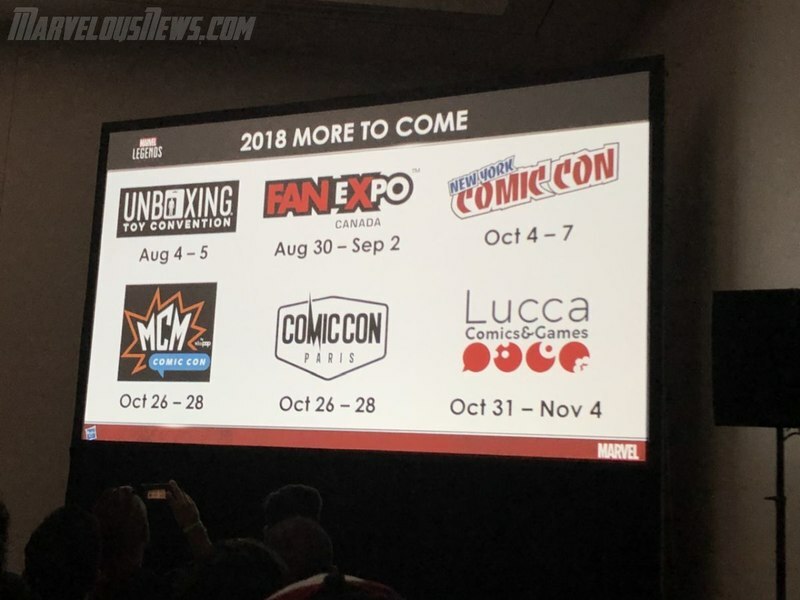 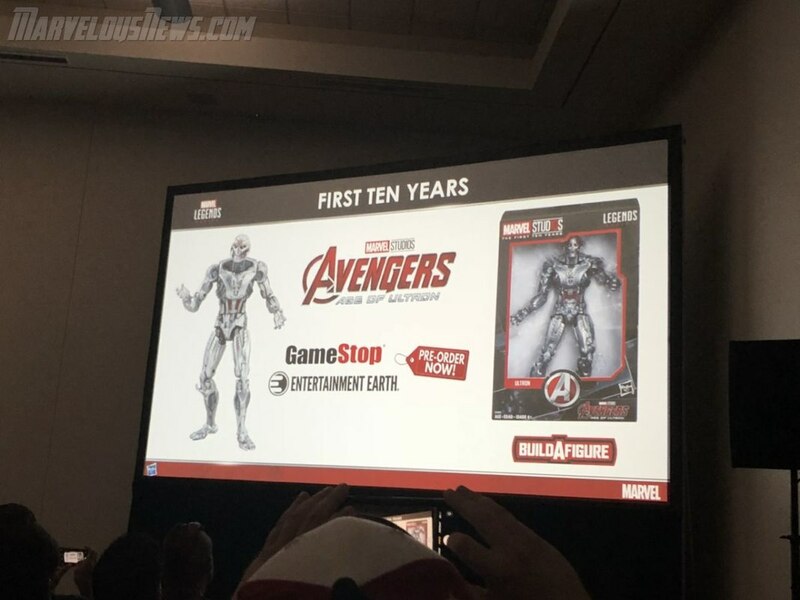 2018 reveals - MCU Ultron will be EE and Gamestop exclusive. 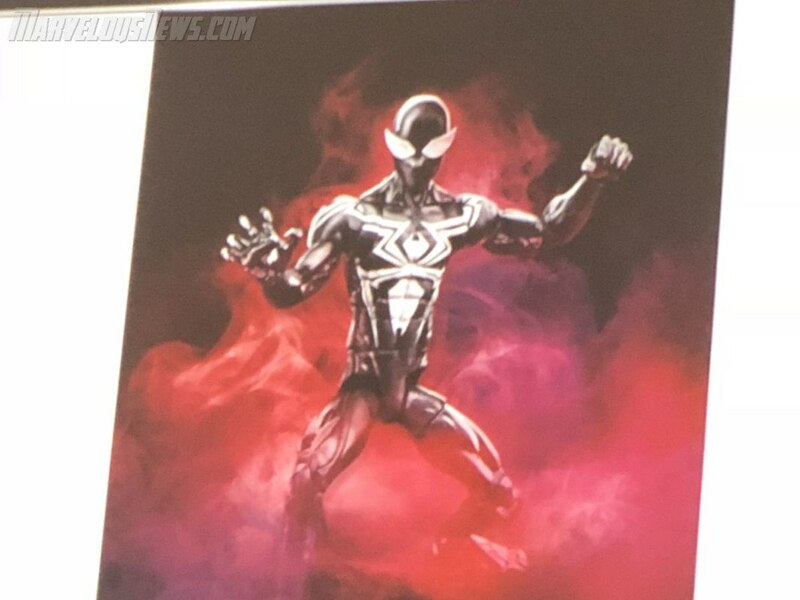 More shinny. 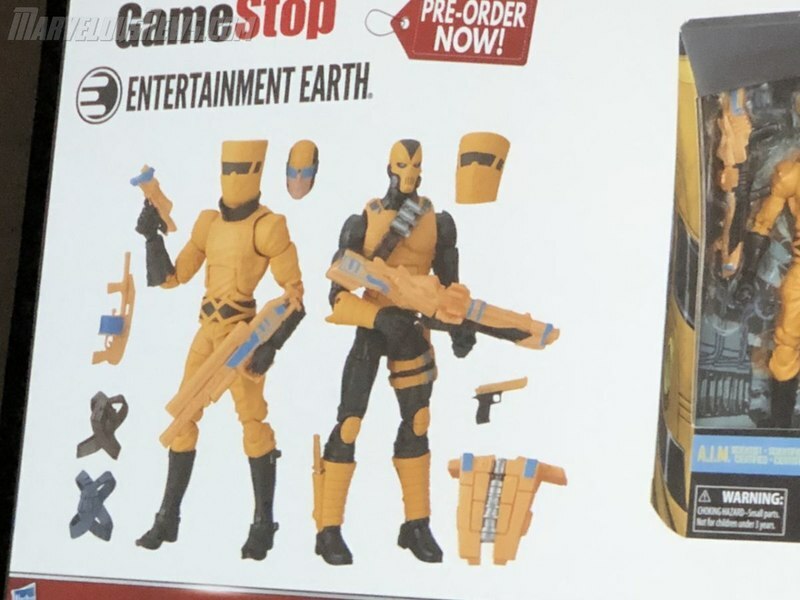 Aim 2-Pack Gamestop and EE exclusive. 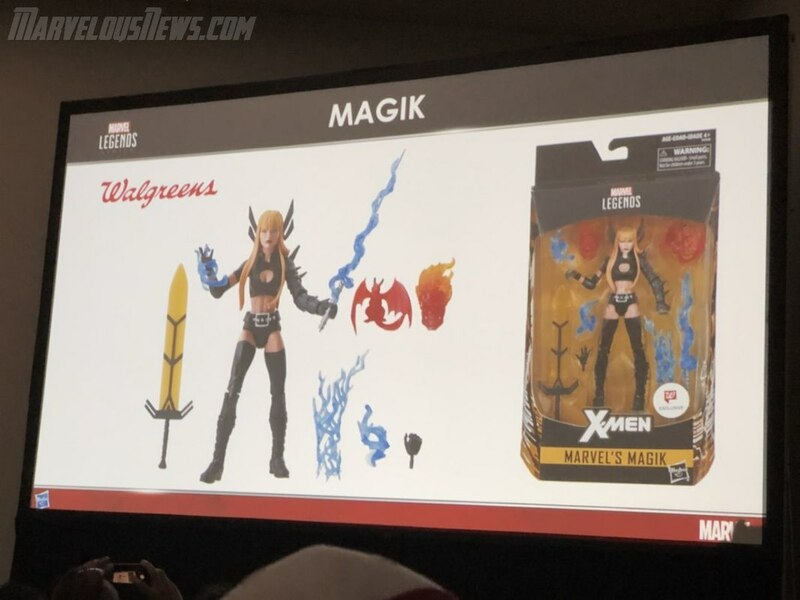 Magic will be Walgreens exclusive. 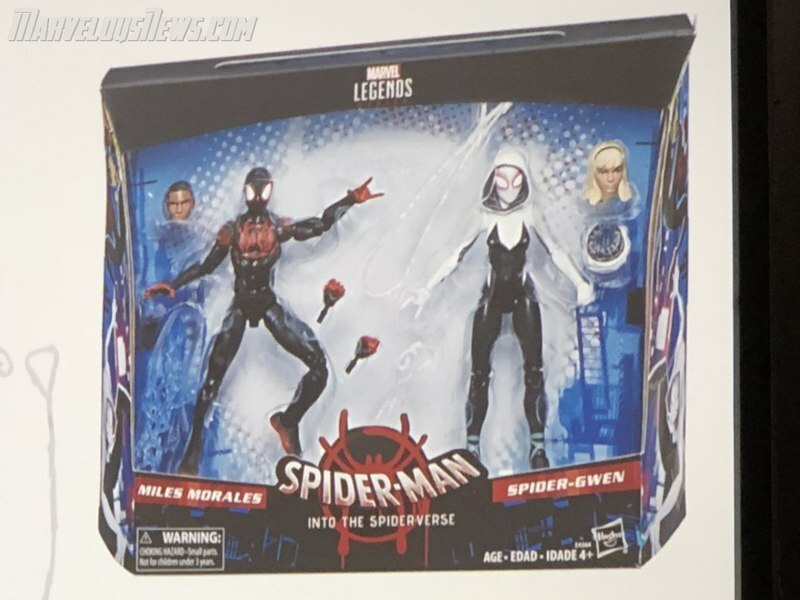 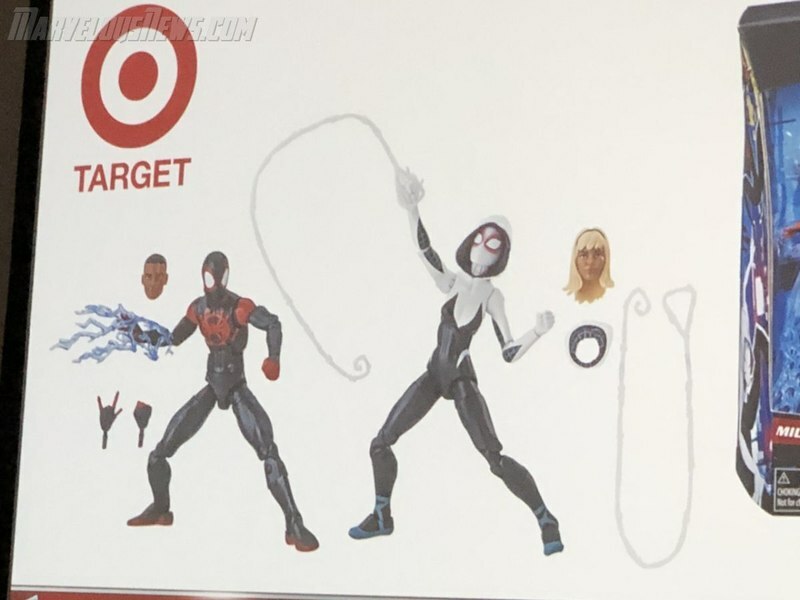 Target Exclusive Into The Spider-Verse 2-Pack with Miles and Gwen. 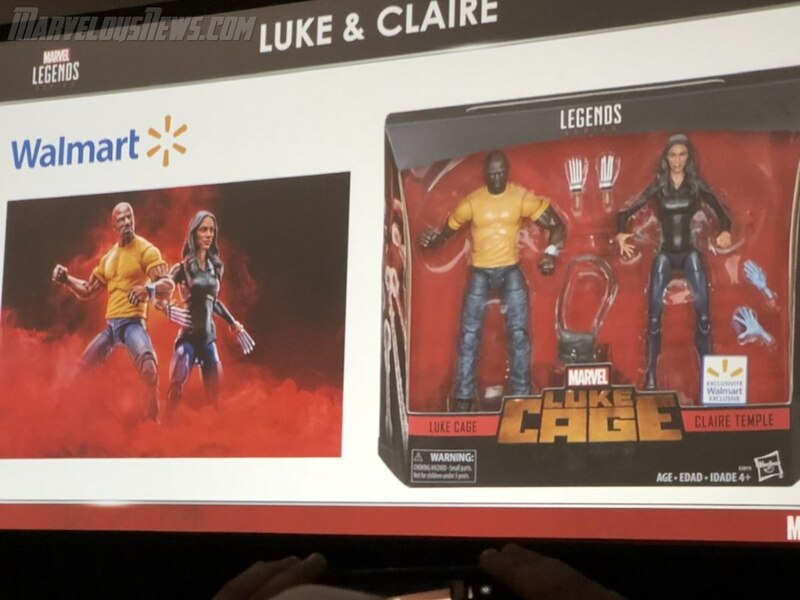 Luke Cage 2-Pack will be Walmart Exclusive. 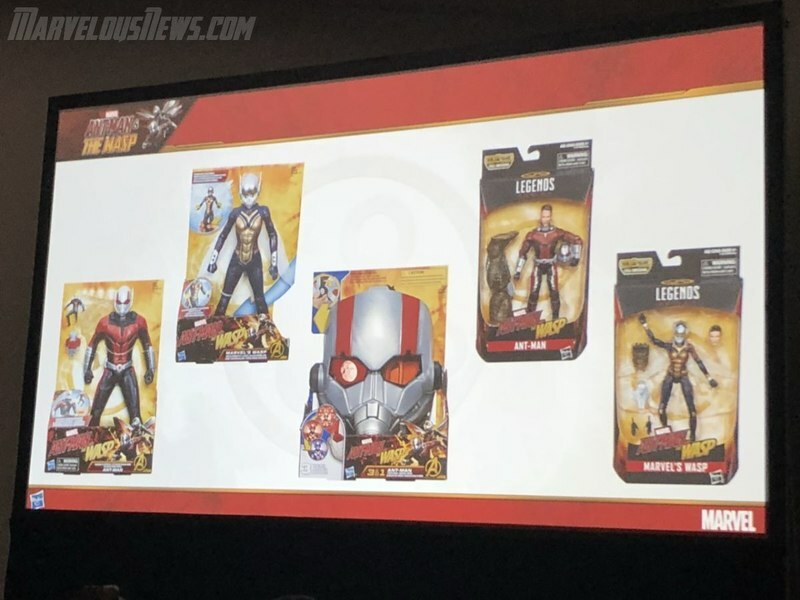 Toy Biz Vintage Line Wave 2 - Ant-Man, Wasp, Scarlet Spider, Black Panther, Hawkeye and Vistion. 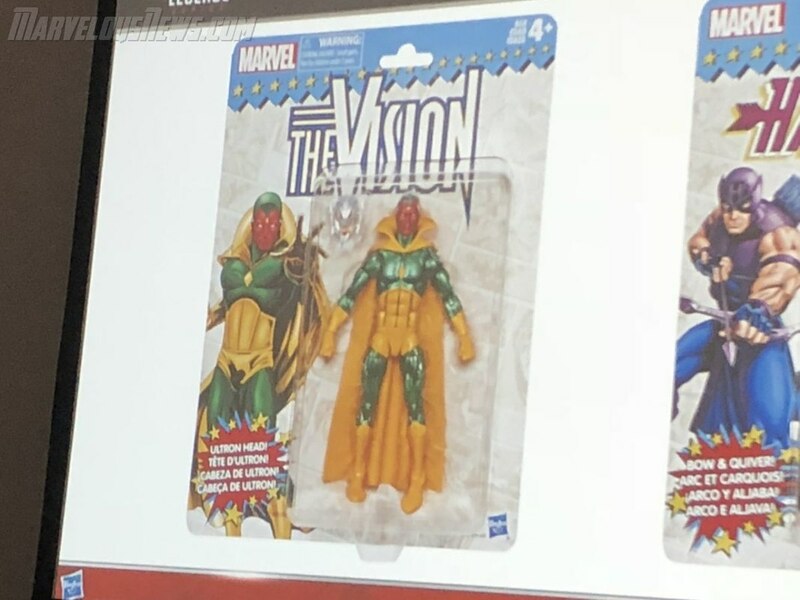 Vision has an extra Ultron head. 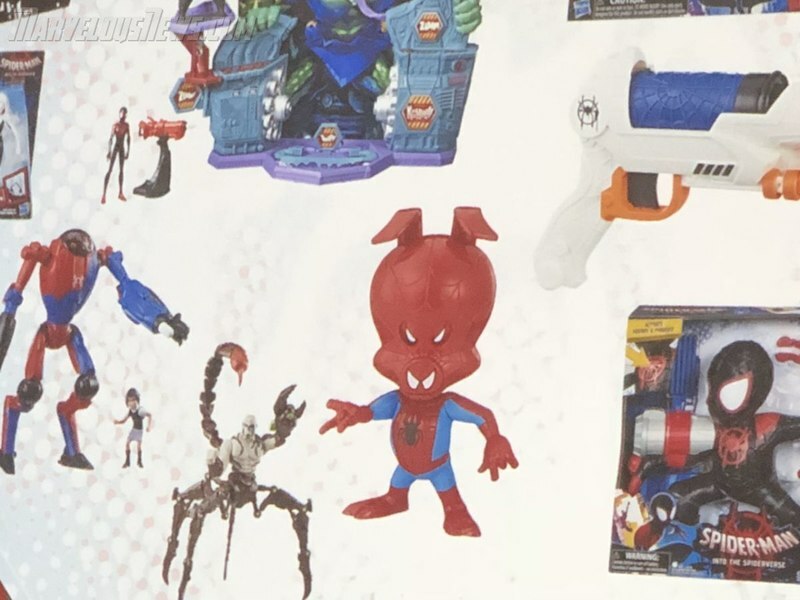 Spider-Man Wave 1 -Modern Symbiot Spider-Man, Red Goblin, Black Cat & Silver Sable and BAF is Kingpin with 3 heads an diamond cane. 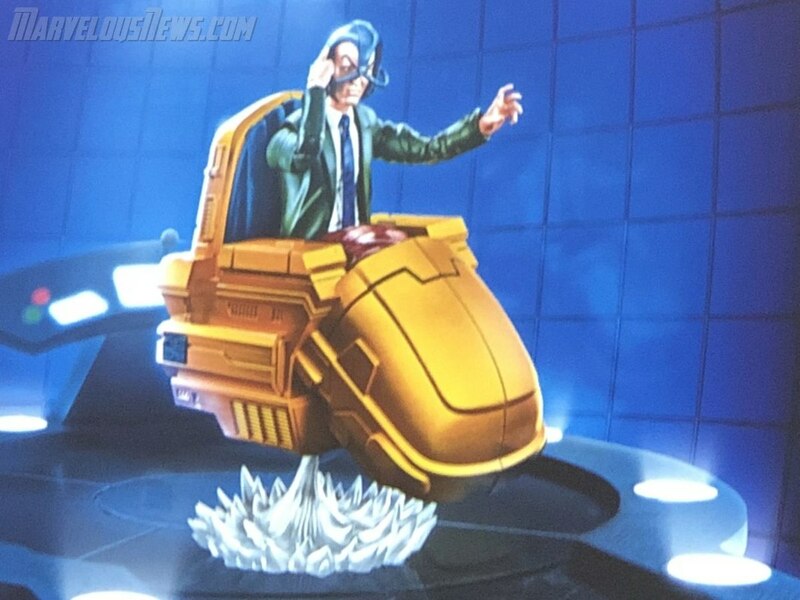 Are getting however Prof X, Skullbuster, Blink, Forge teased but not confirmed and BAF is not a Hover Chair but they aren't revealing it. 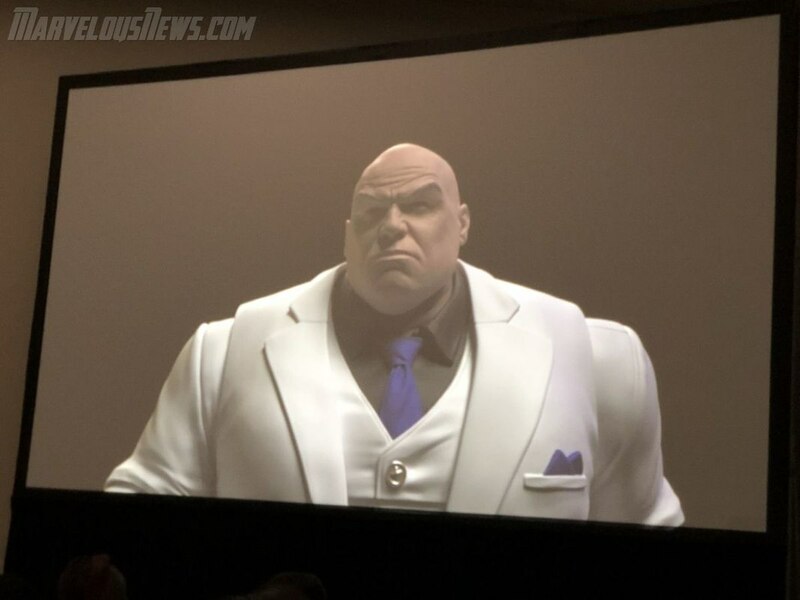 It is a character and big, very big. 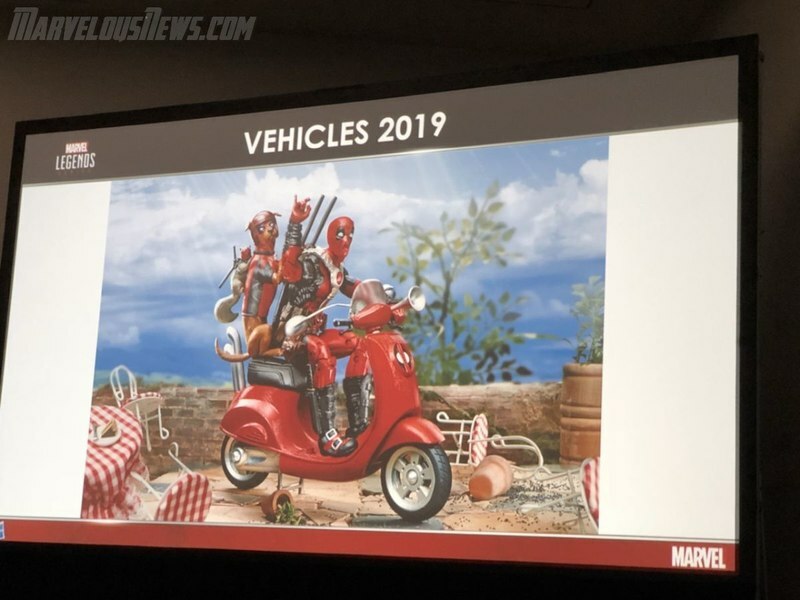 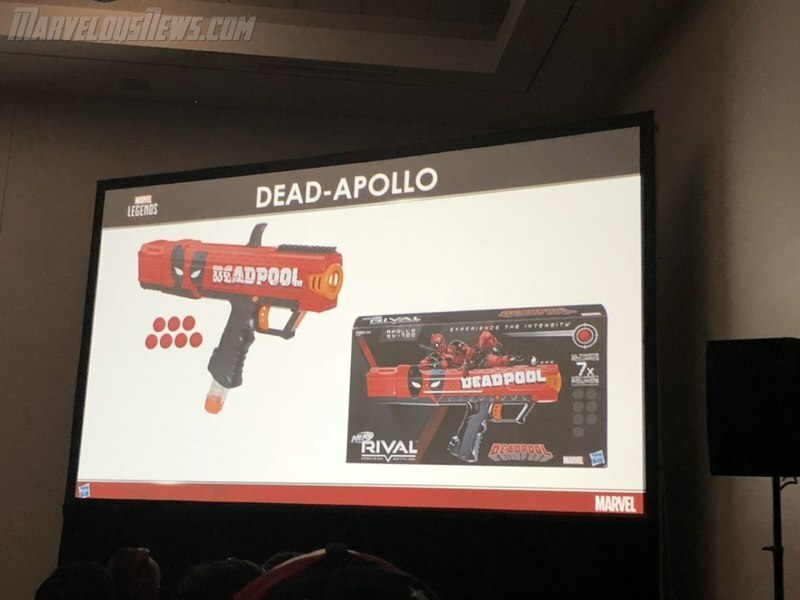 Rider Series with Deadpool and Scooter with new Deadpool head. 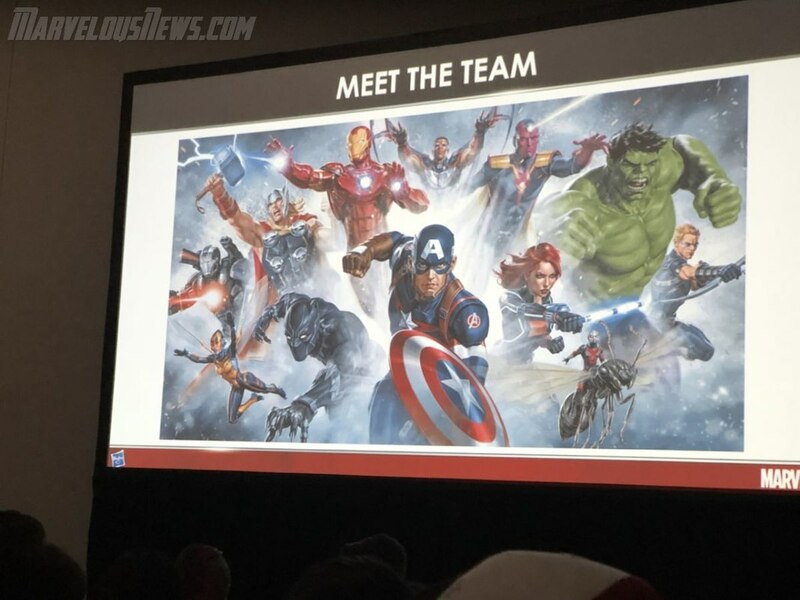 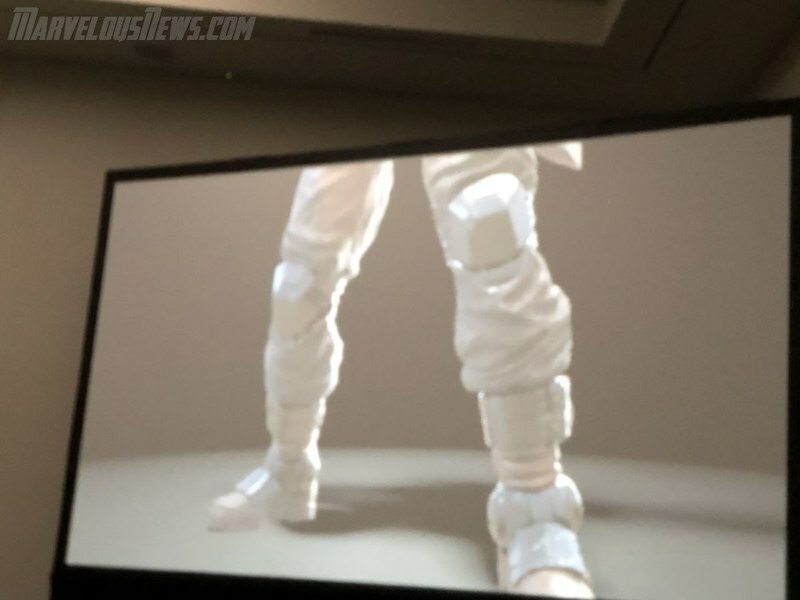 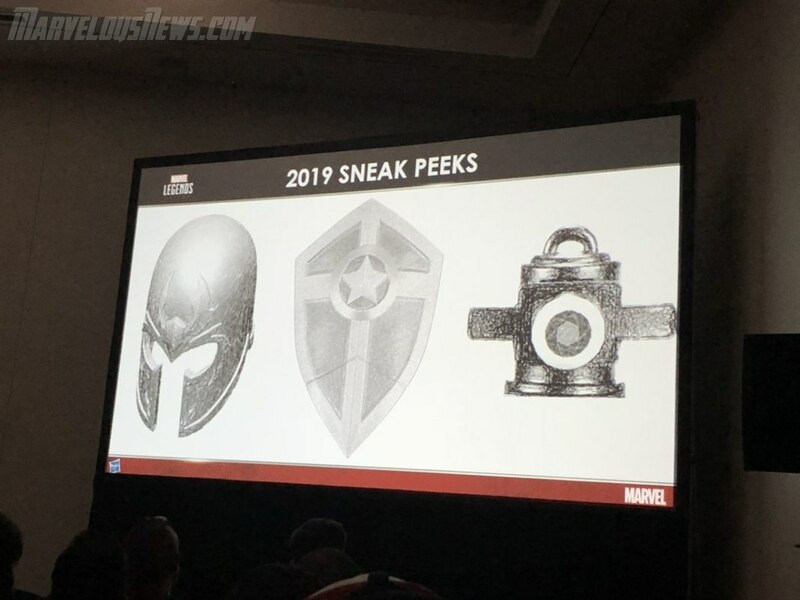 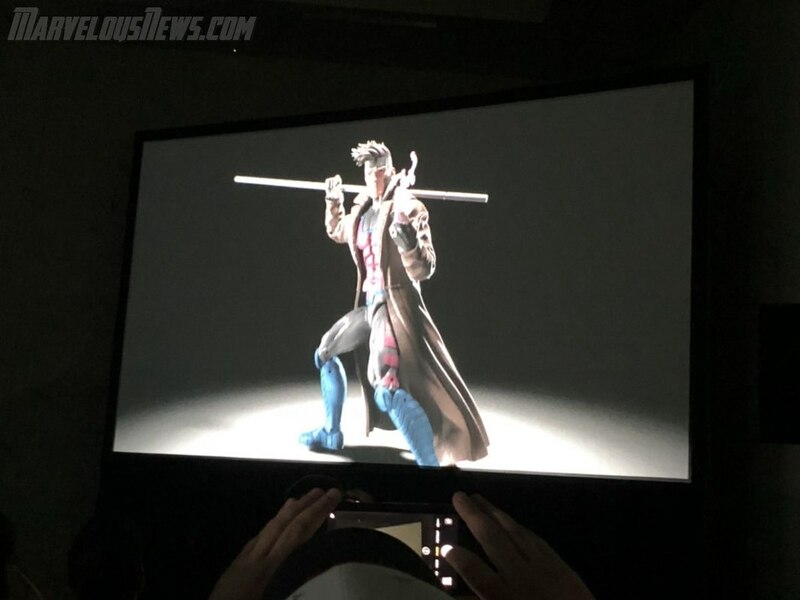 Teases - Magneto, Hydra Cap and Mystique and Quicksilver and something unknown, see pic below. 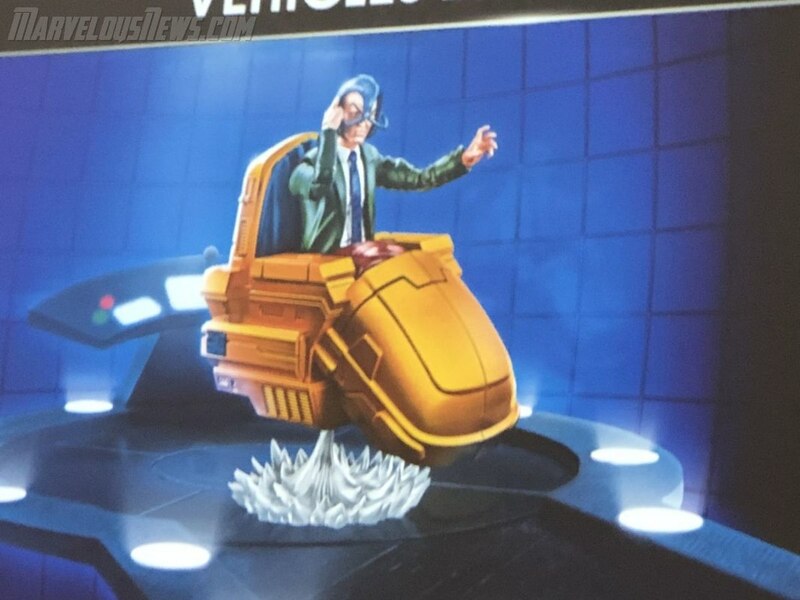 Professor X with Hover Chair coming to Riders line. 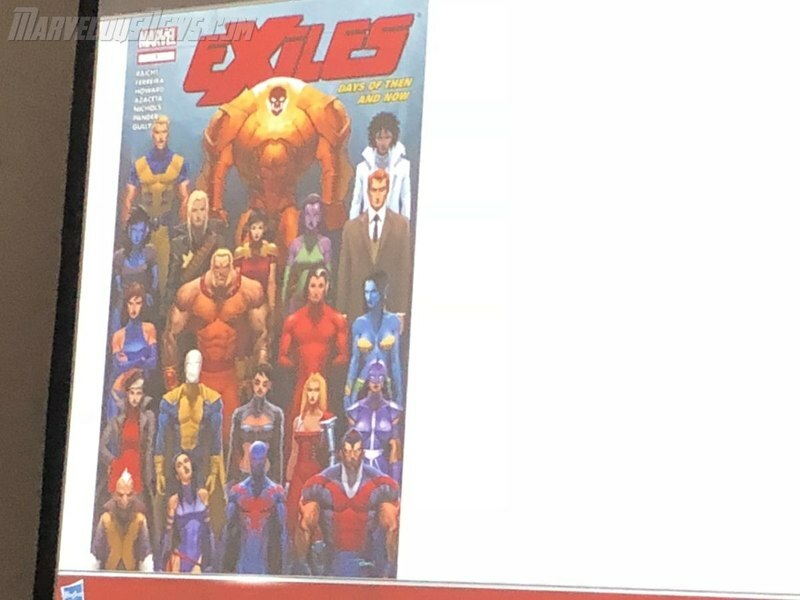 In Q&A Jesse said he would like to start seeing teams completed. 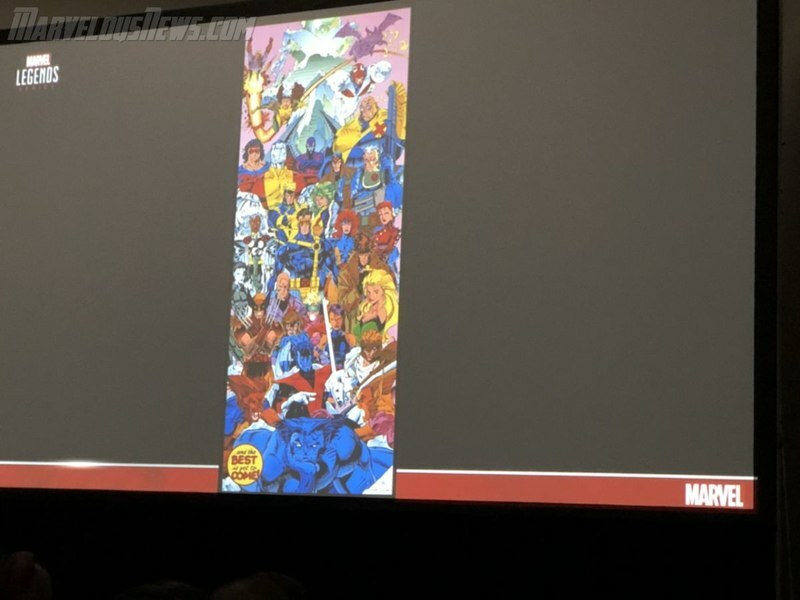 For those wanting Black Order the panel says your patience will be rewarded. 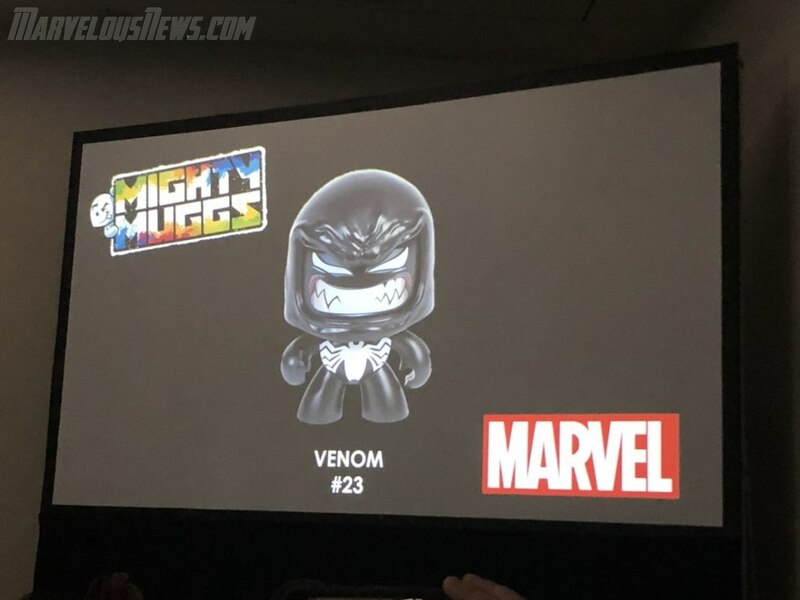 Venom movie figures is a possibility. 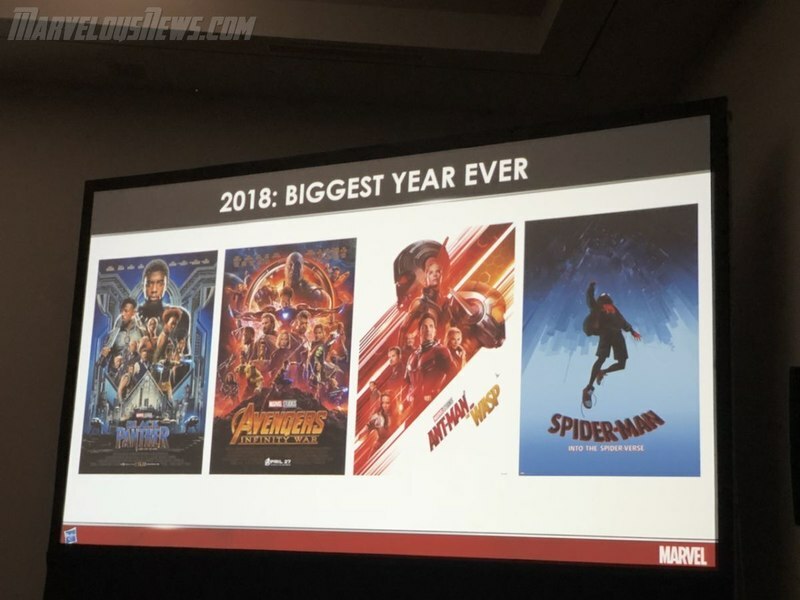 Maybe, lot will depend on the movie rating which is unknown right now and if its good. 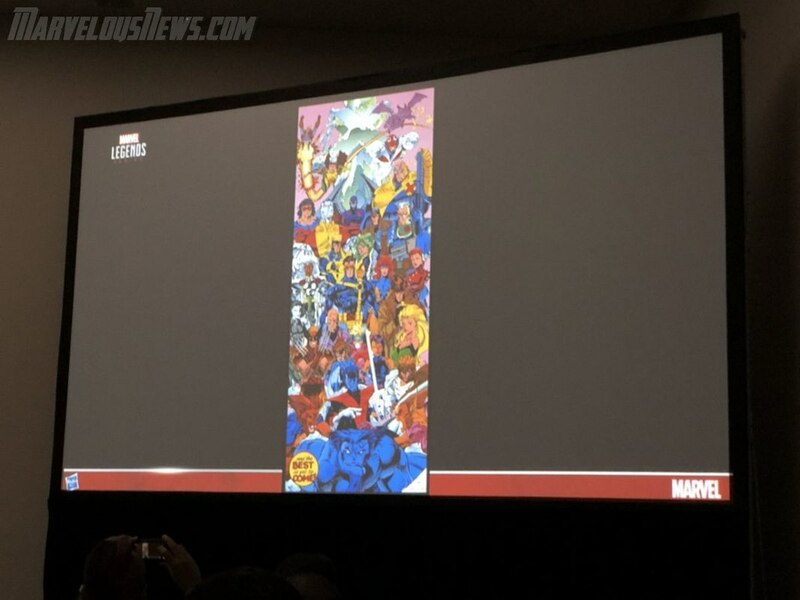 Panel ends. 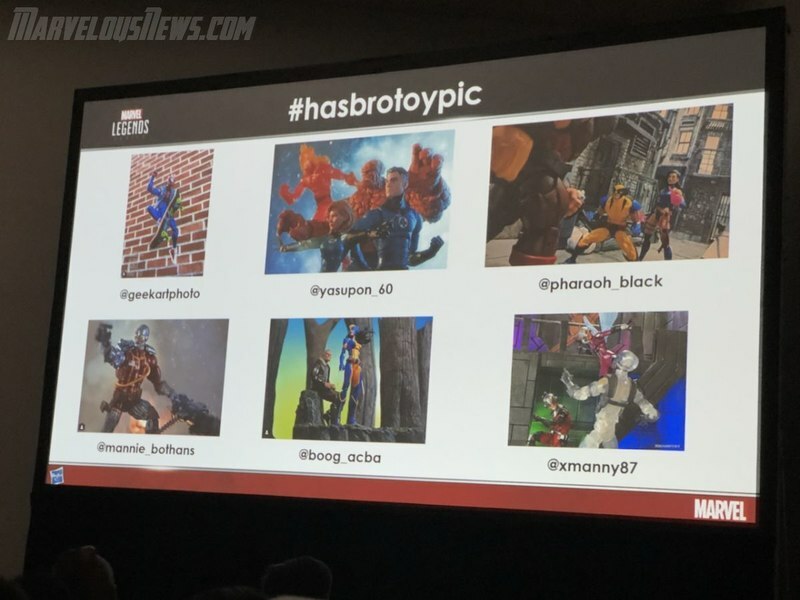 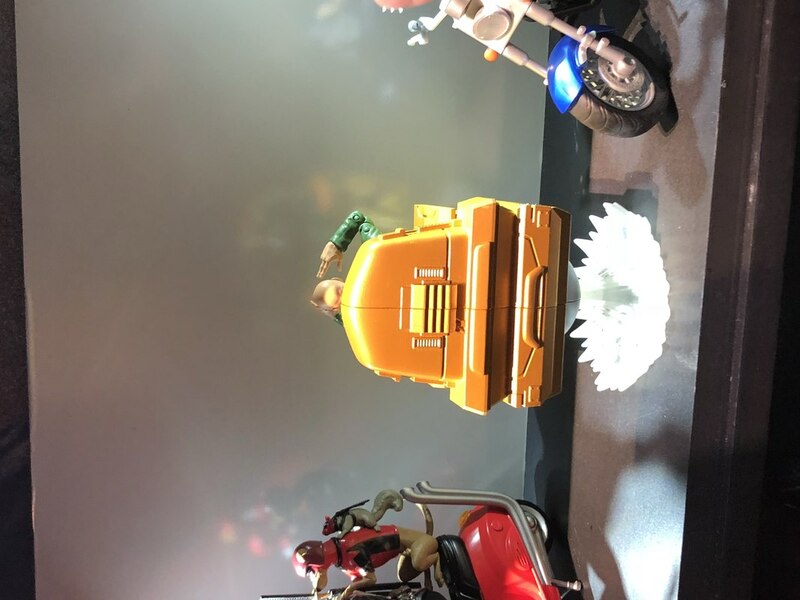 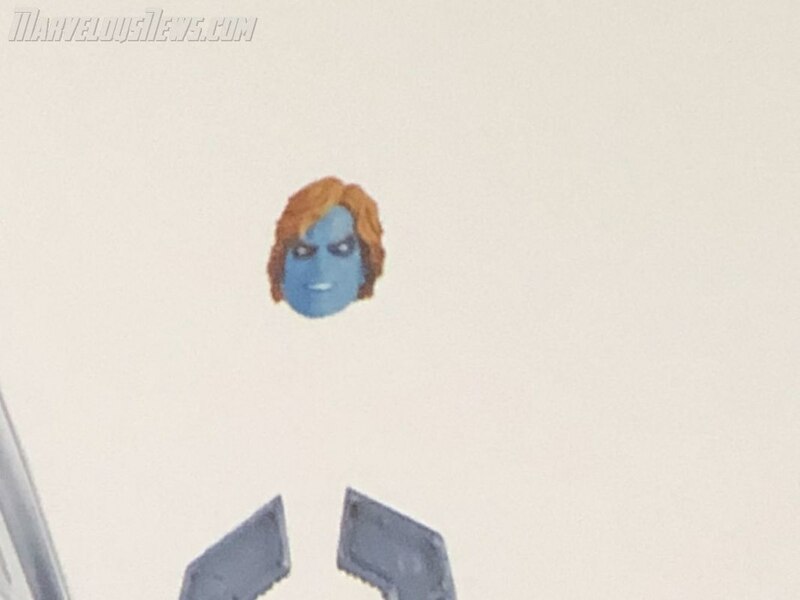 Check back soon for new reveal images from the Hasbro booth coming up soon. 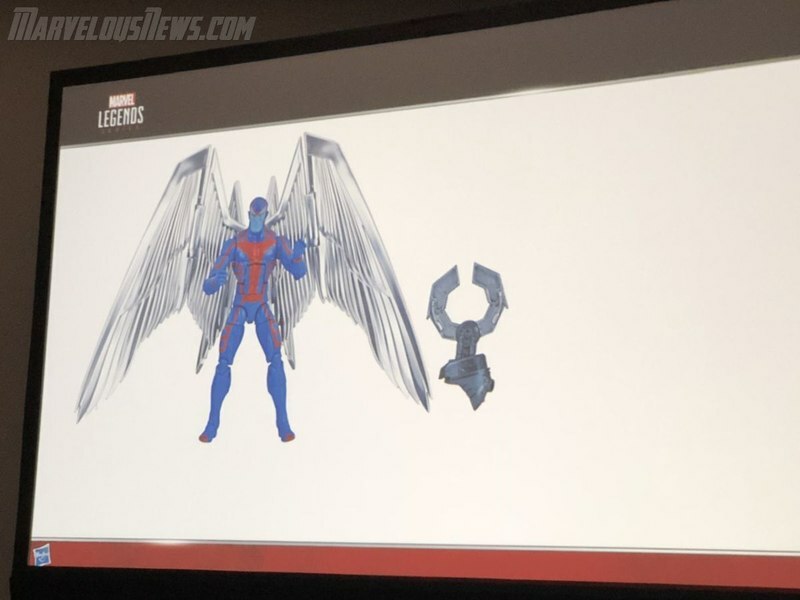 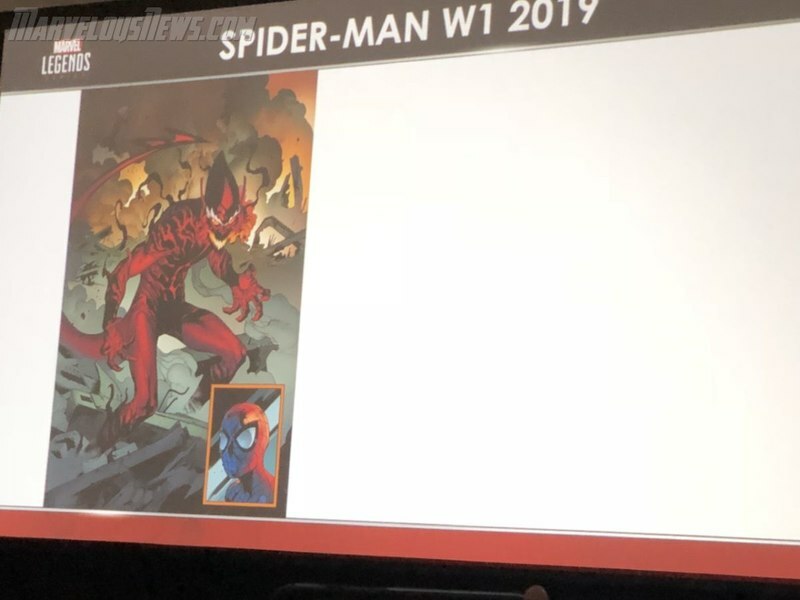 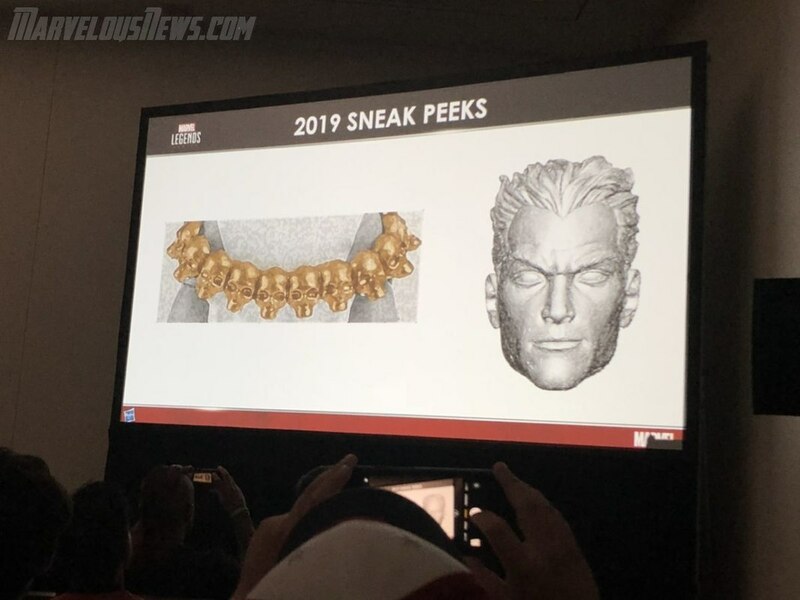 I think the skull is from a Ghost Rider figure just like the little red/orangey dragon is a Lockheed; I believe they are supposed to represent demons from limbo or something. 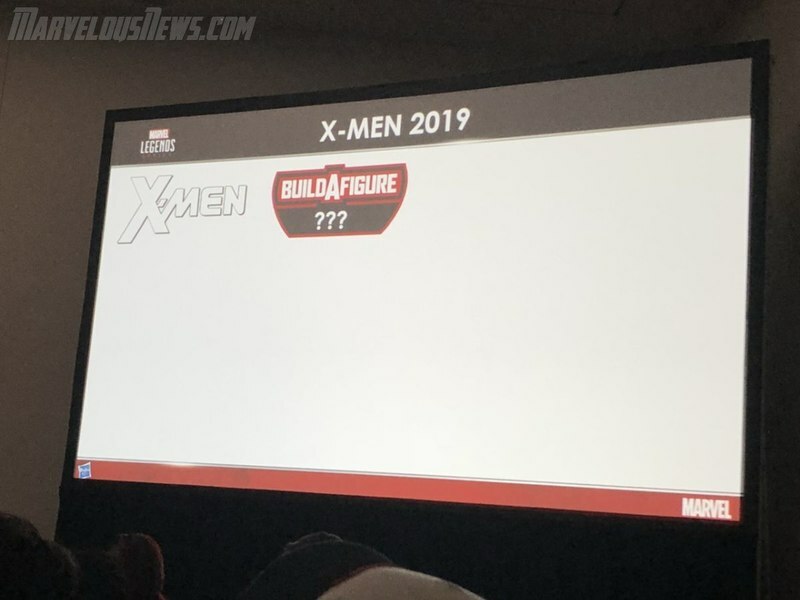 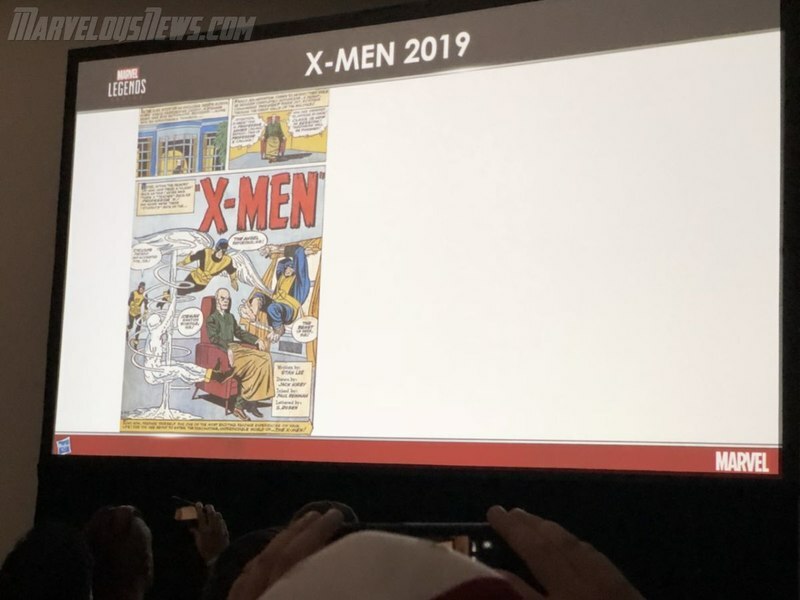 It is my understanding that Prof. X with chair is gonna be part of the Rider series and them showing the single Professor X was Hasbro messing with the fans making them believe that he was gonna be single carded. 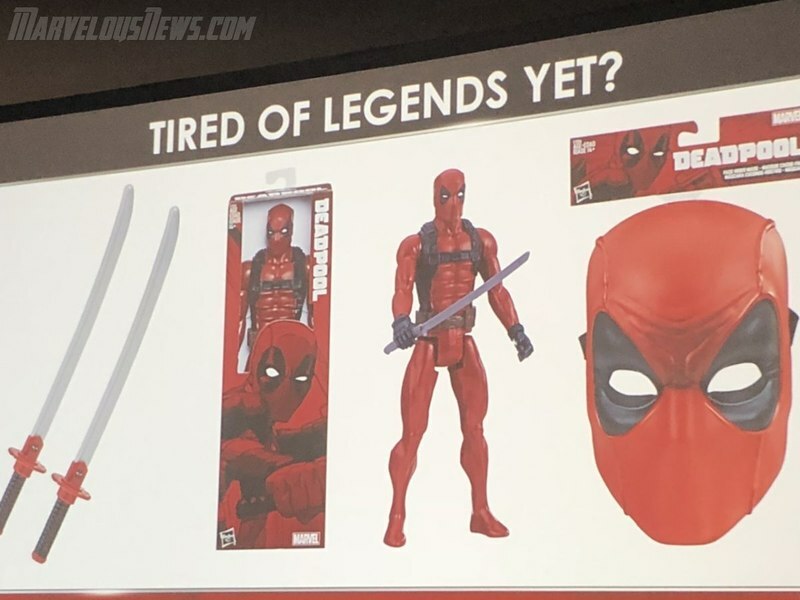 I could be wrong, though but that's the way I see it. 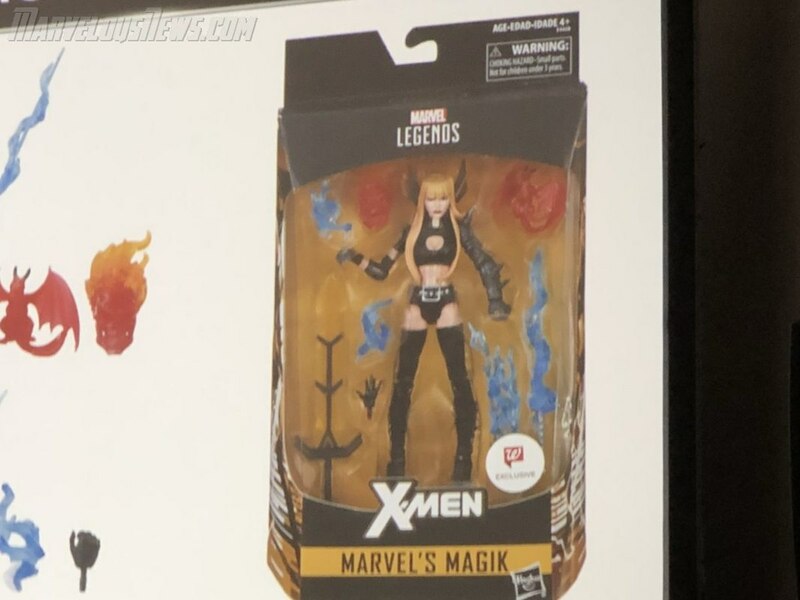 Who does the skull head belong to that comes with Magik?? 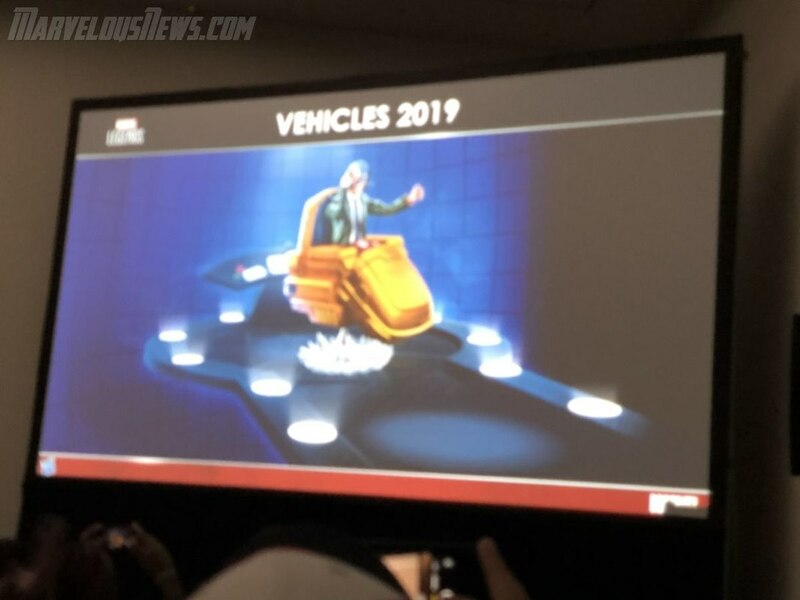 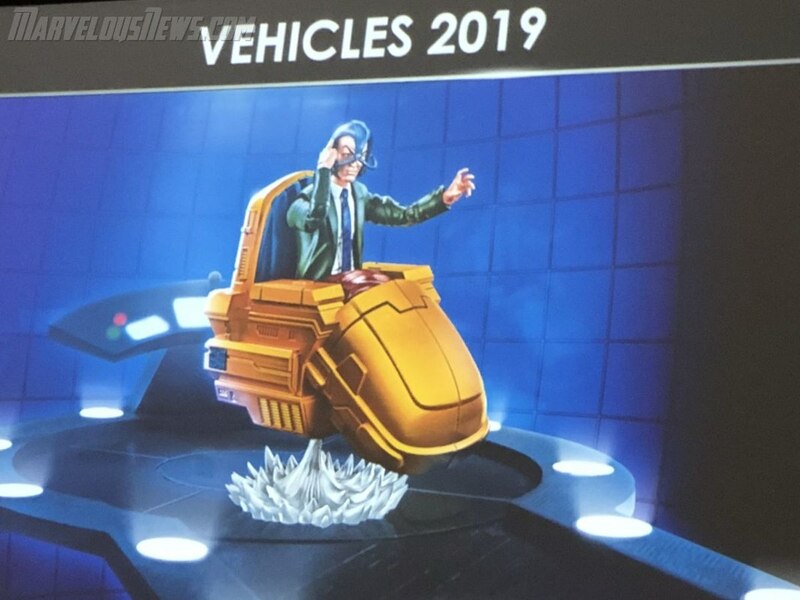 also we get Professor X but no chair but we are getting one in the riders wave. 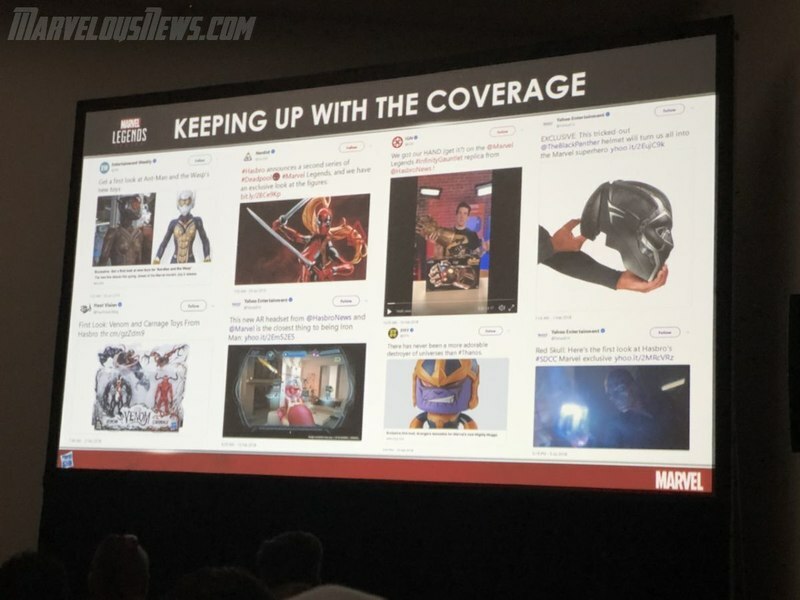 This is great coverage. 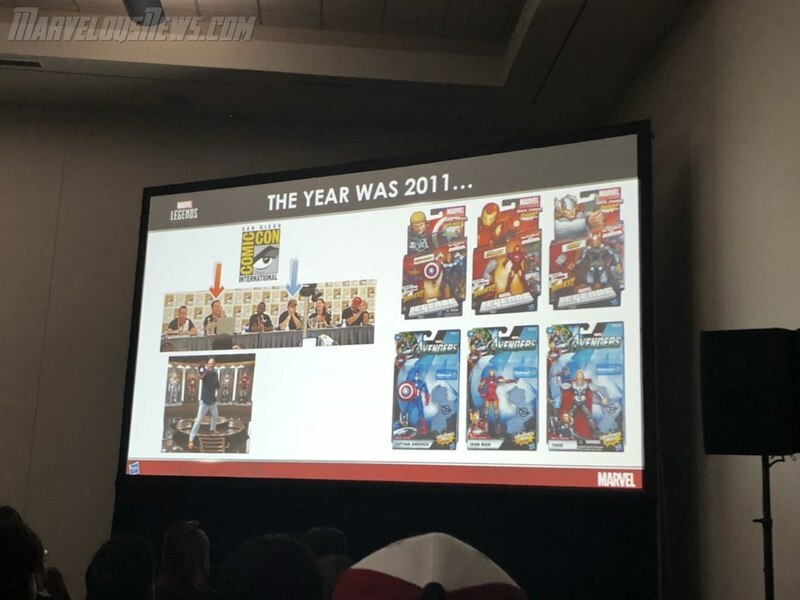 Thanks for putting this informationout for us. 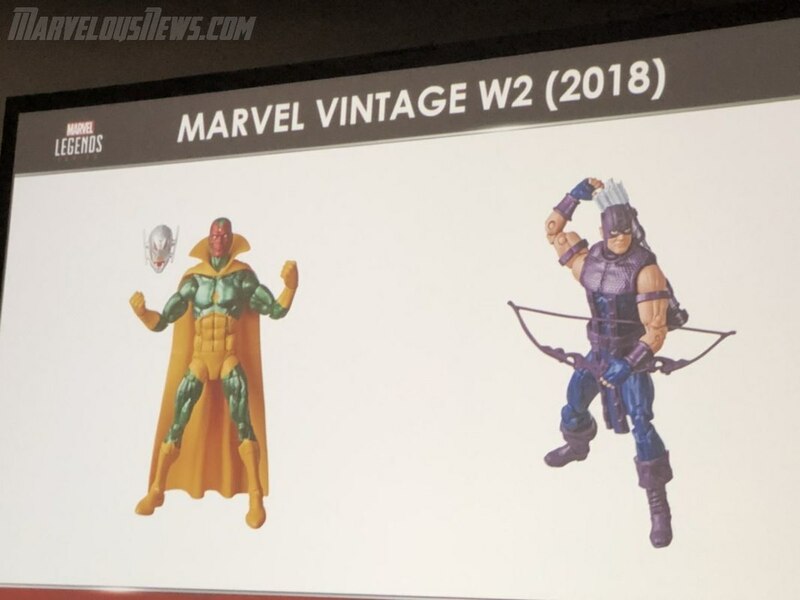 I am still waiting on those Warriors Three Marvel Legends. 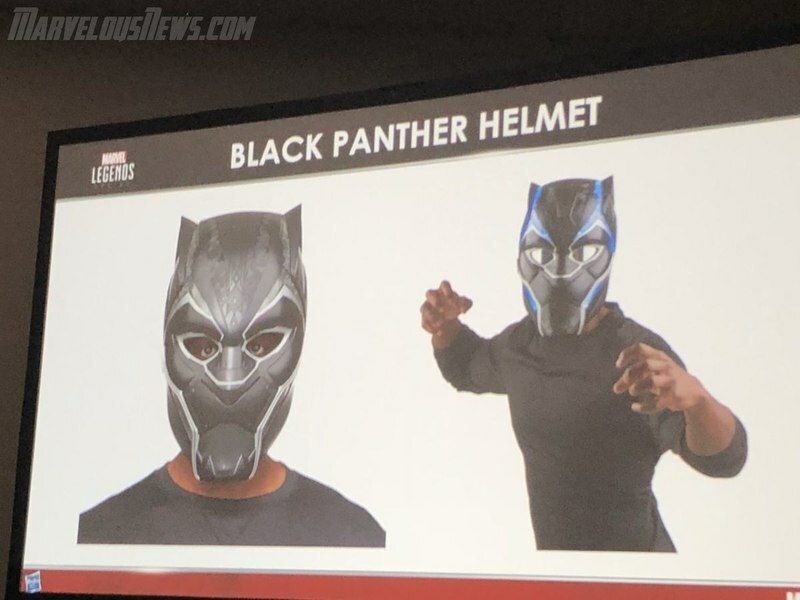 That would be tight. 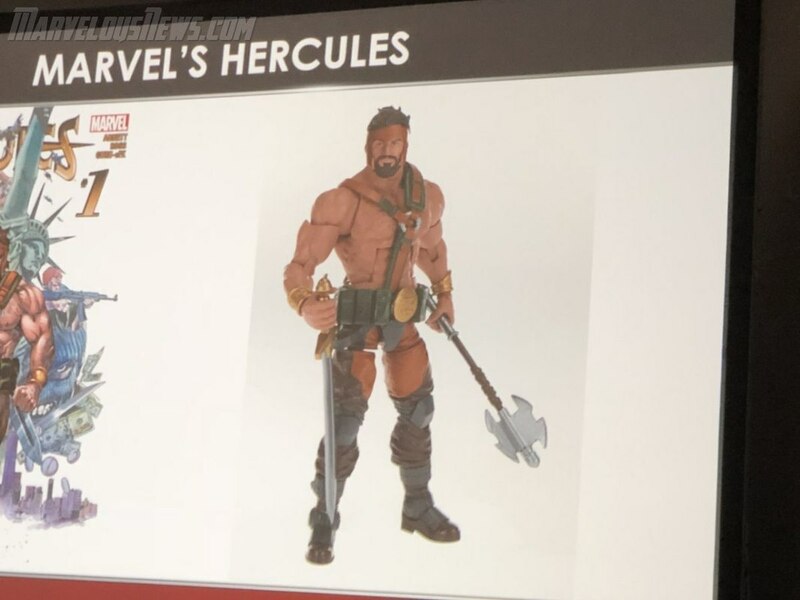 If this set came out, I might actually build an Asgardian wing for my collection. 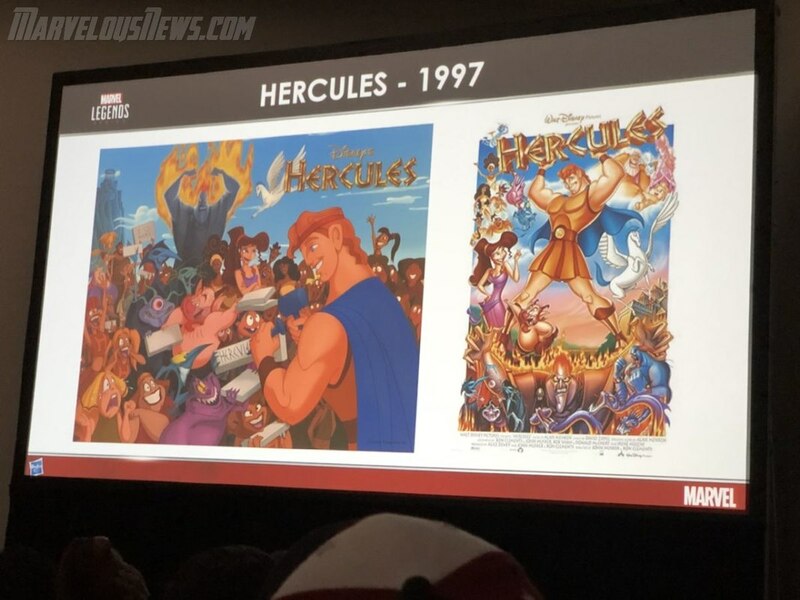 Thank you so much for bringing us all this great information. 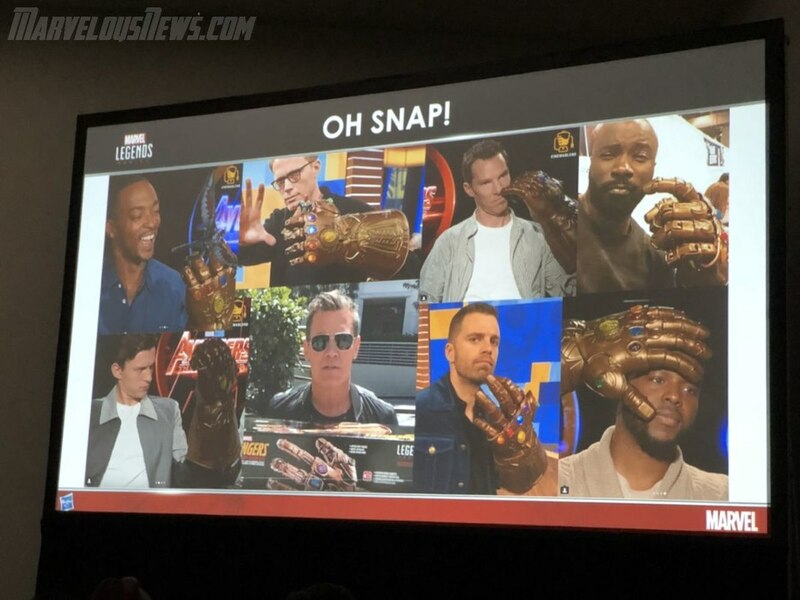 I really love this site. 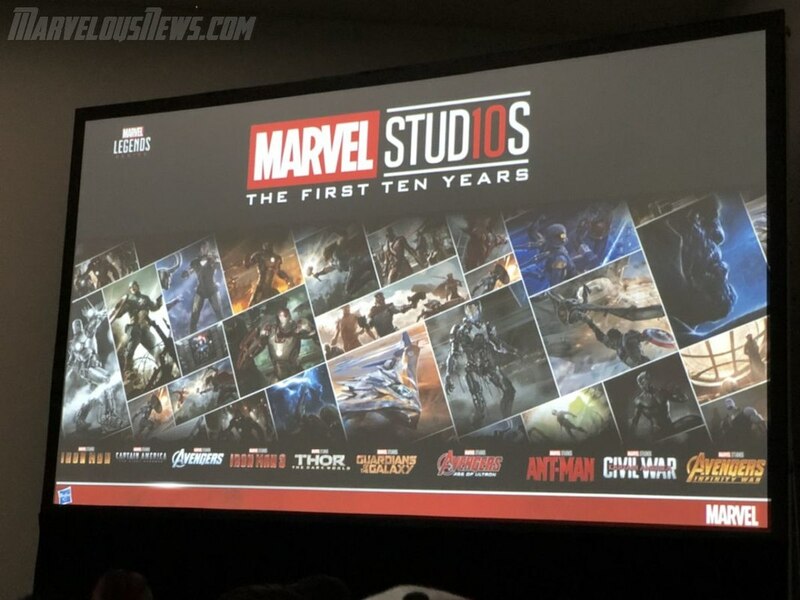 If it wasnt for JayC, I would have not known about this site. 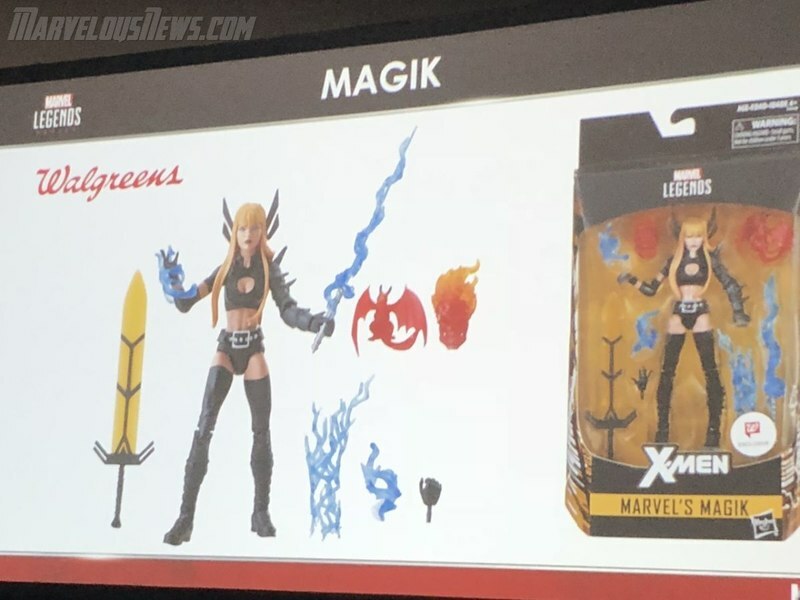 When is Magik going to be available? 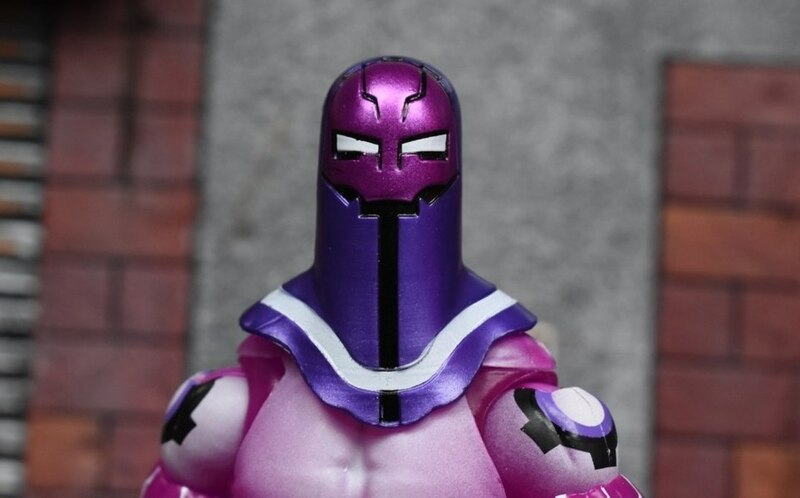 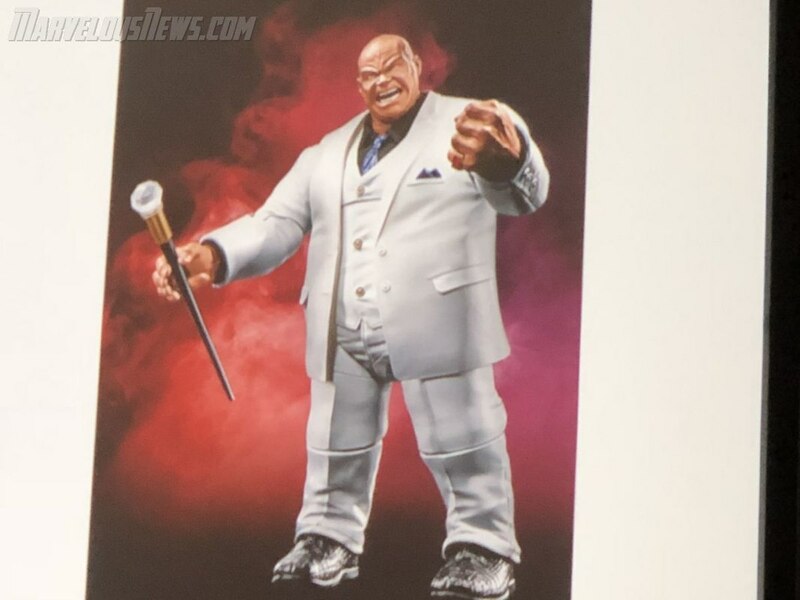 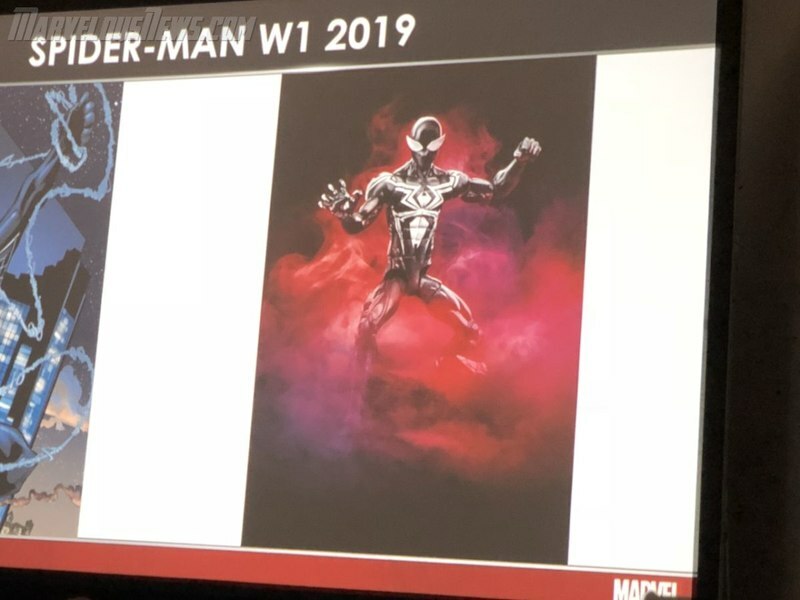 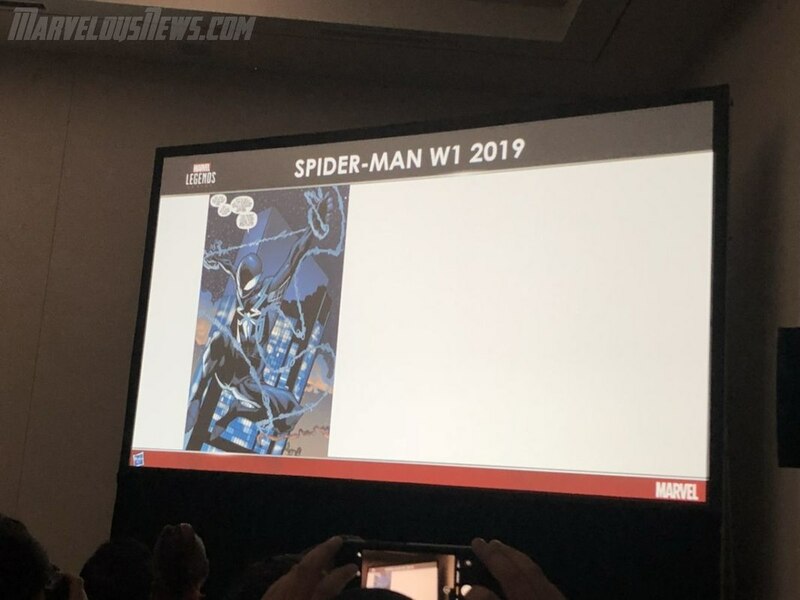 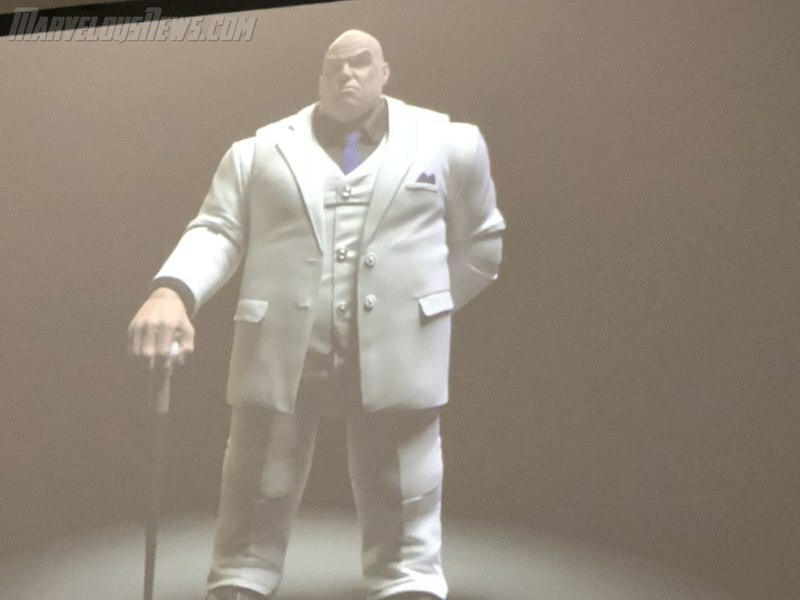 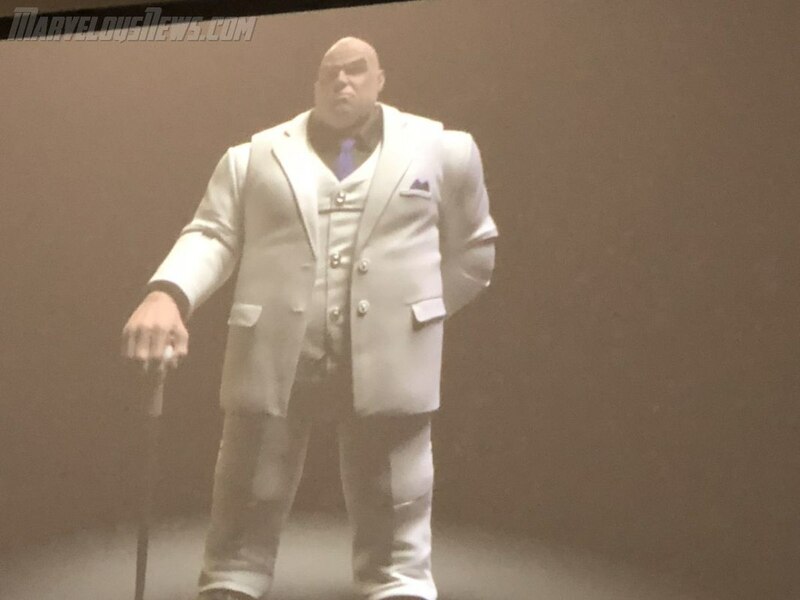 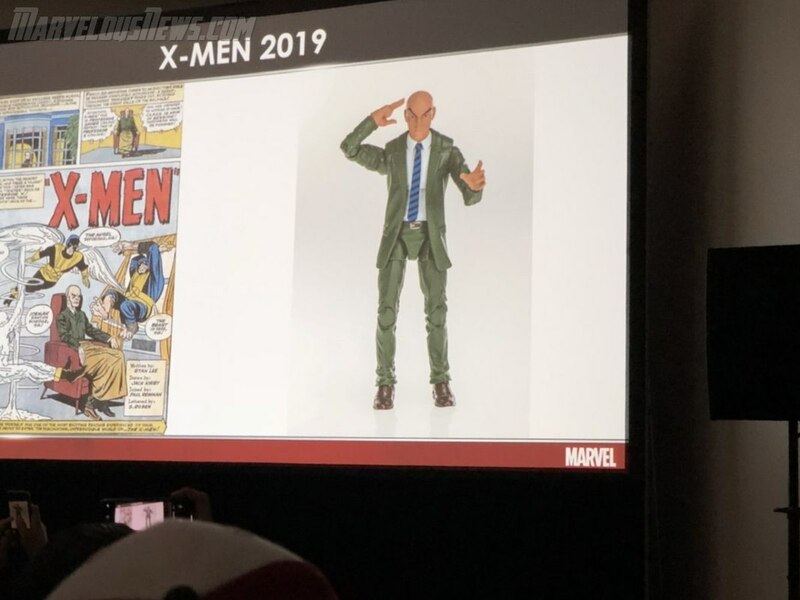 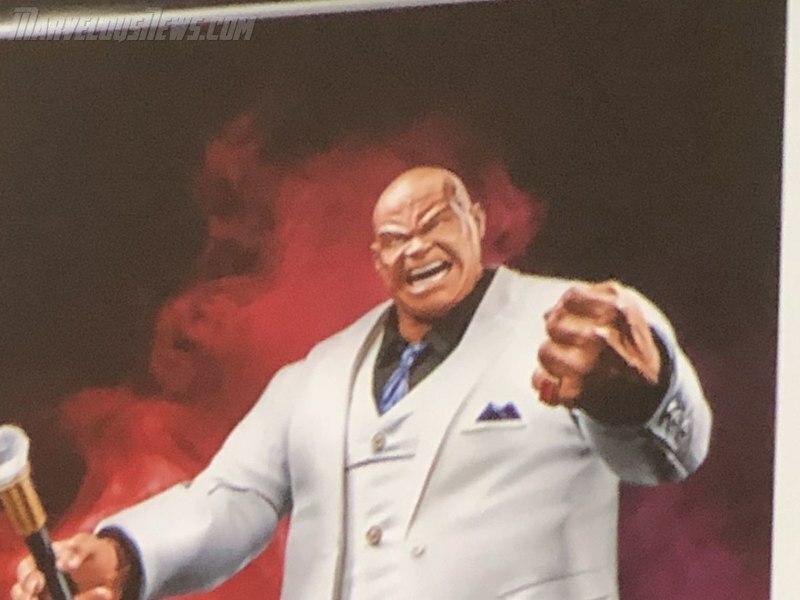 Pretty excited to see the rest of this new 2019 Spider-Man KingPin BAF wave.